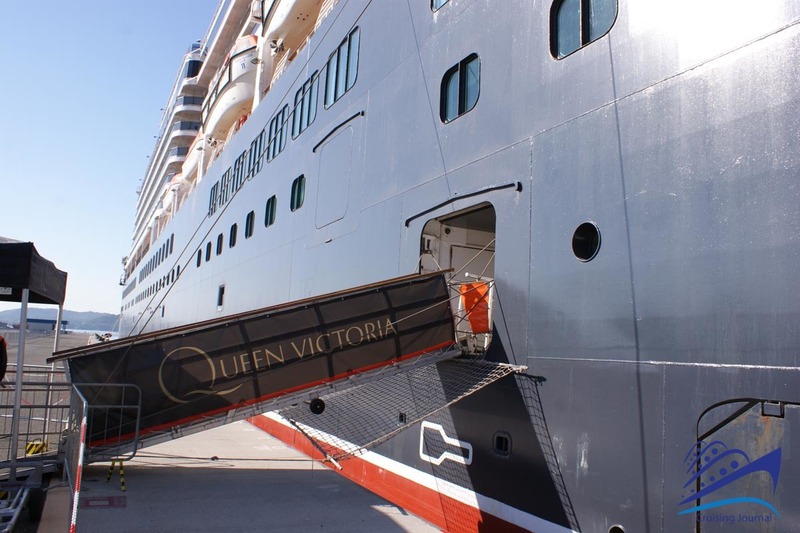 Queen Victoria is a cruiseship built by Fincantieri and launched in 2007 for Cunard Line. 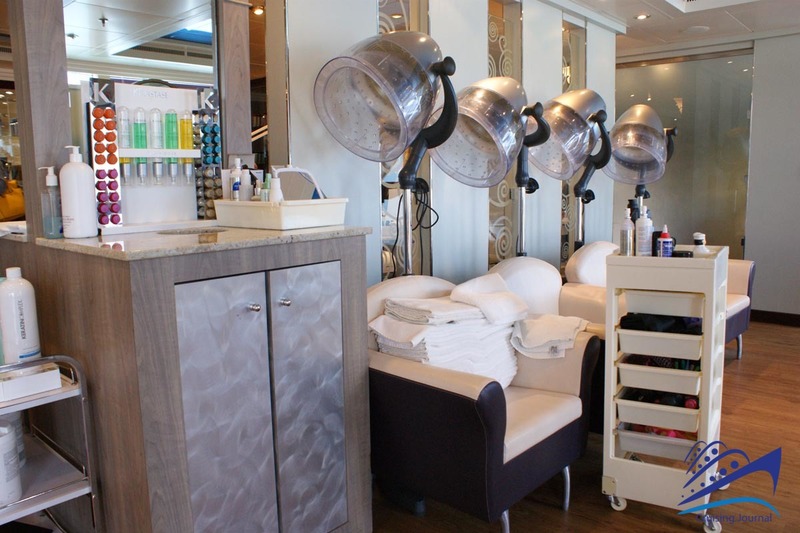 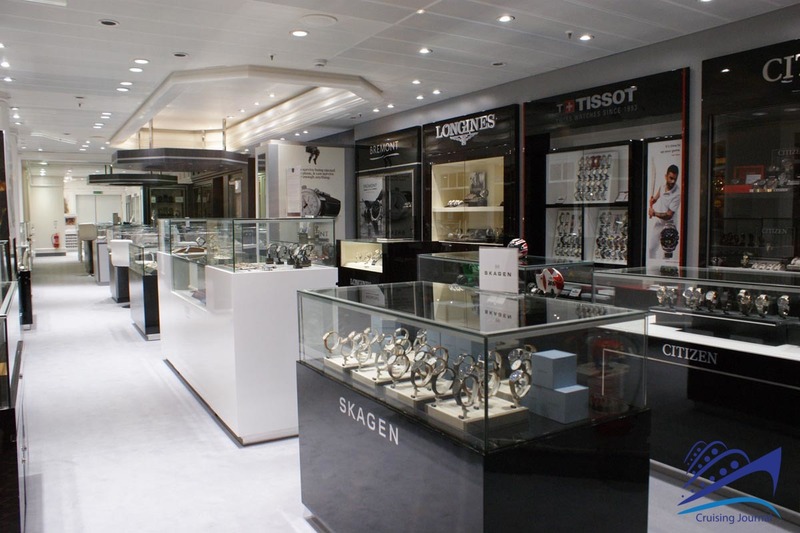 In 2017, ten years after its launch, it underwent major restyling partially renovating the spaces and equipping the ship with state-of-the-art equipment. 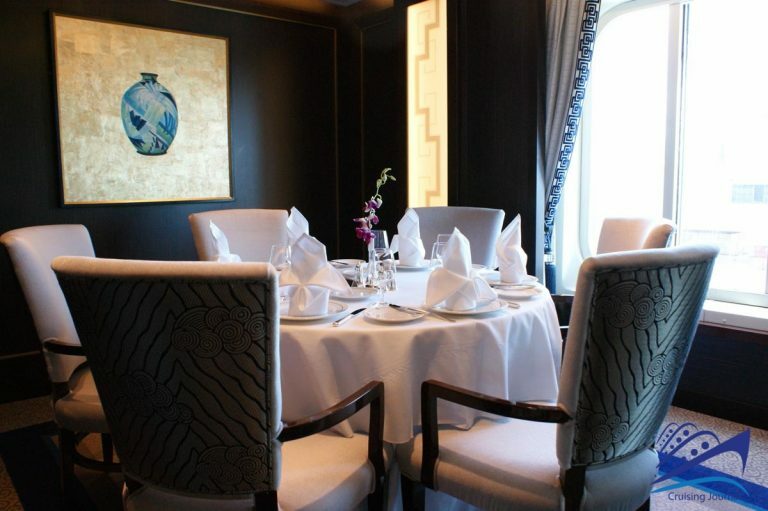 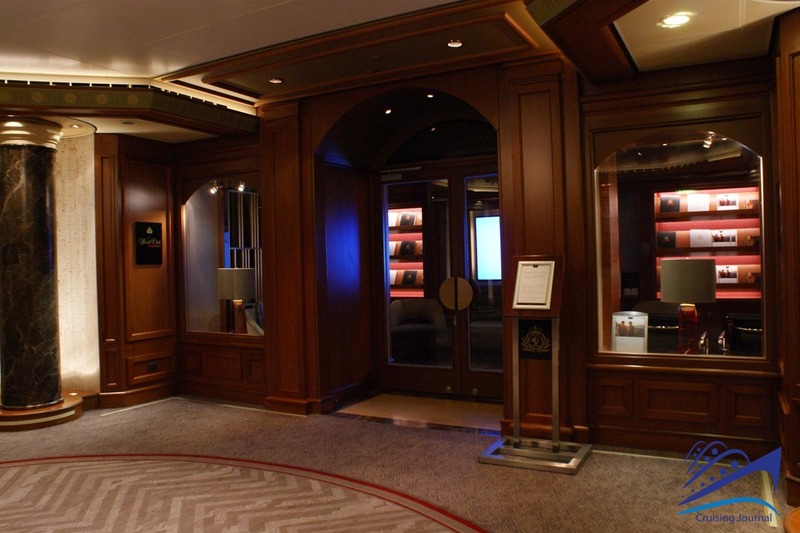 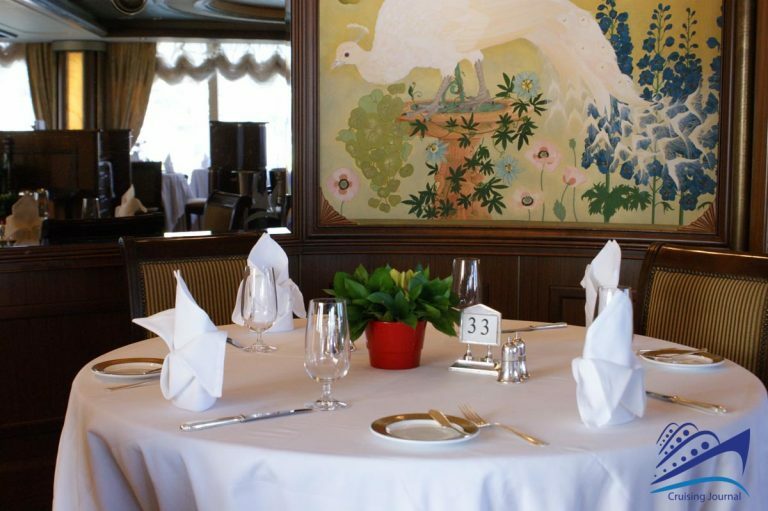 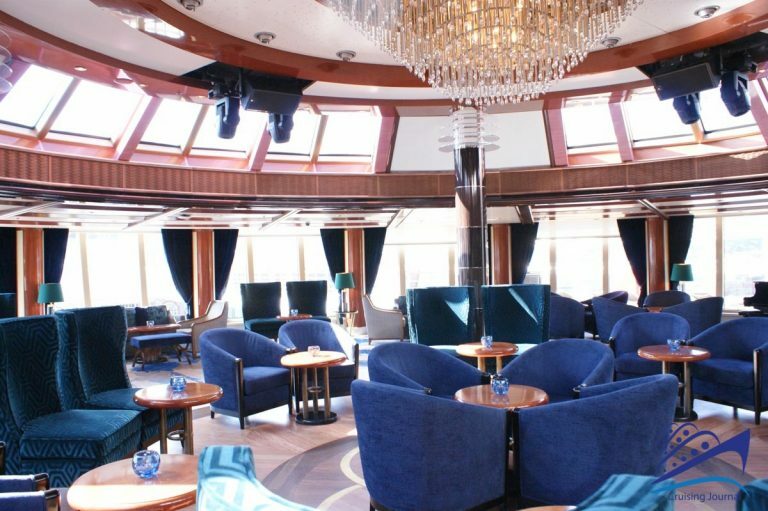 During the drydock period in Palermo, 43 Britannia Club cabins were added as well as an exclusive restaurant located where the Chart Room was once found. 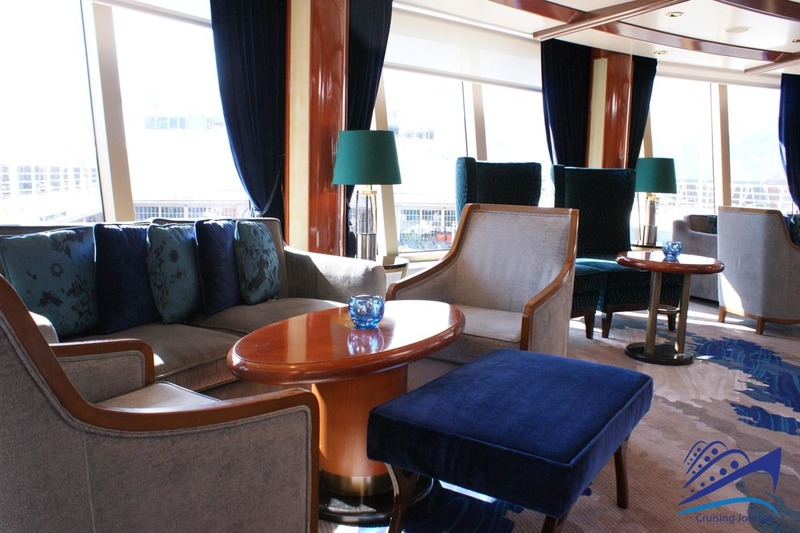 The Suites were partially transformed and equipped with every comfort and amenity. 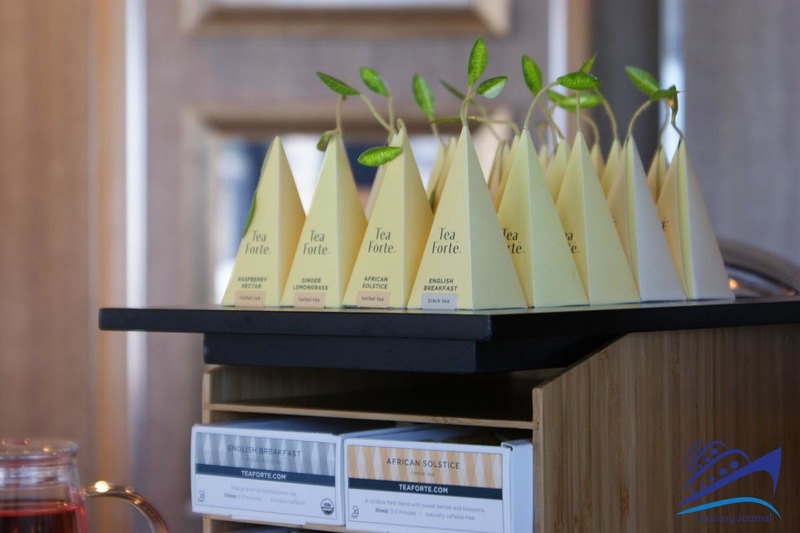 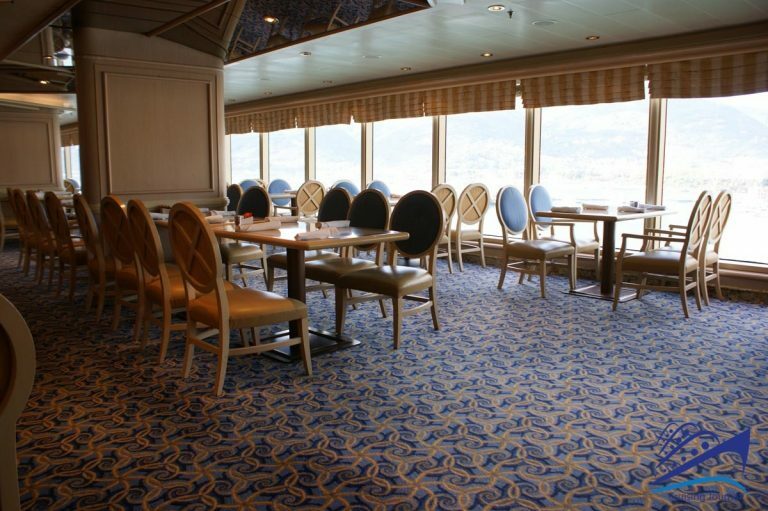 The other cabins were also renovated and tea/coffee stations were added. 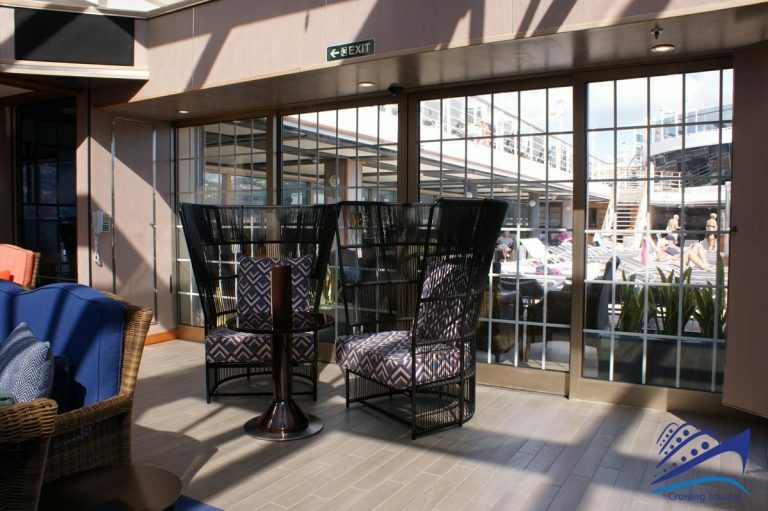 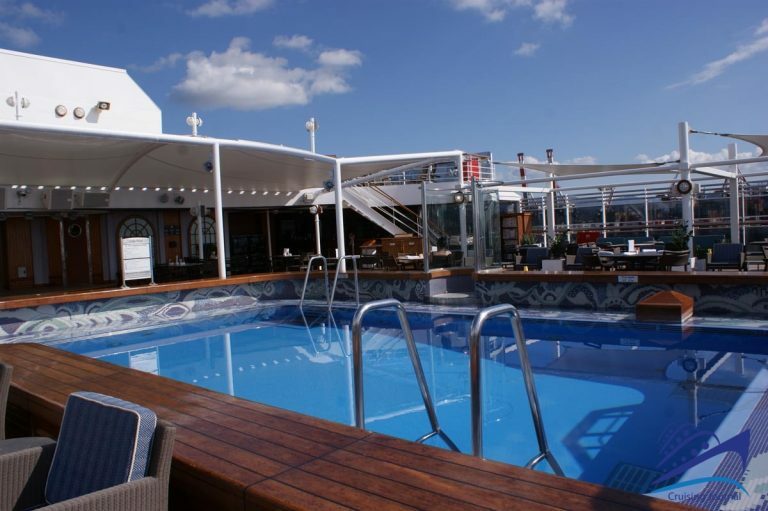 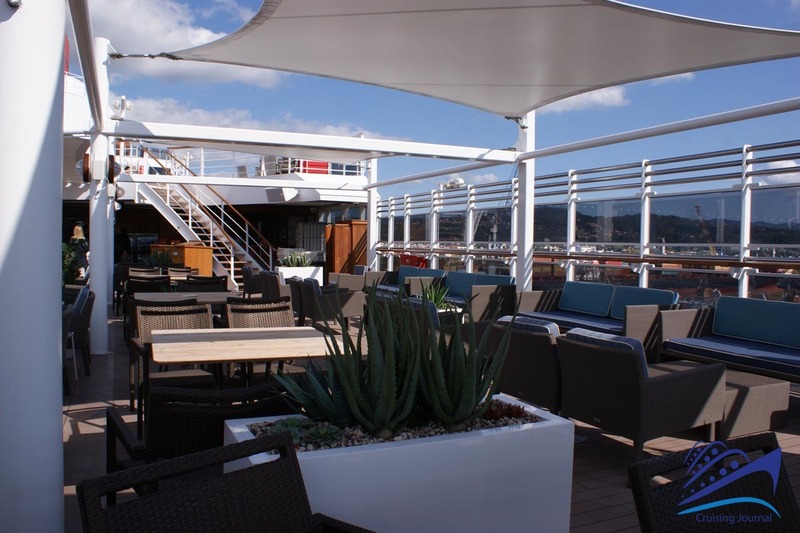 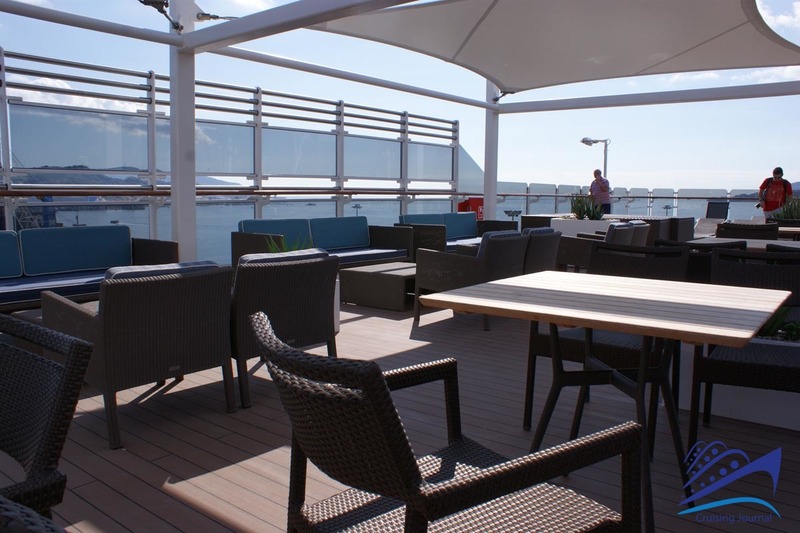 The terrace at the stern of the ship is now covered to protect the sunbeds and sofas, and new alcoves have been added. 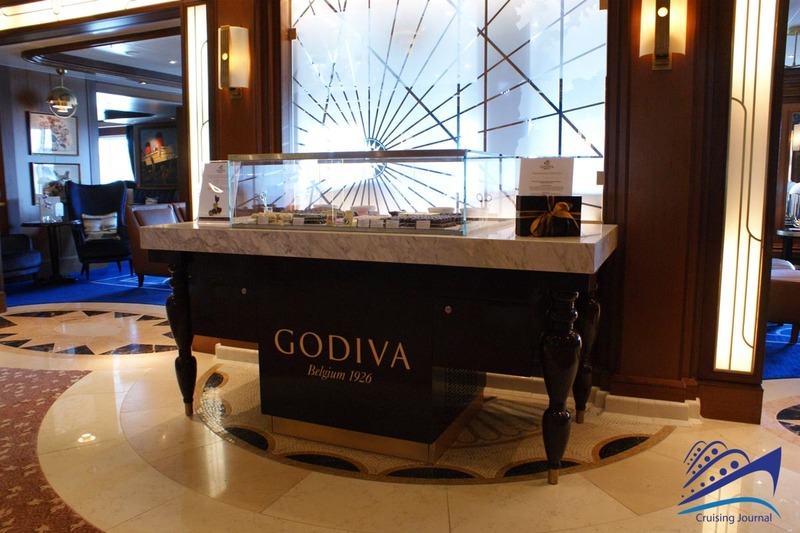 The Carinthia Bar has been updated and streamlined and you can now sample the famous Godiva Belgian chocolate pralines there. 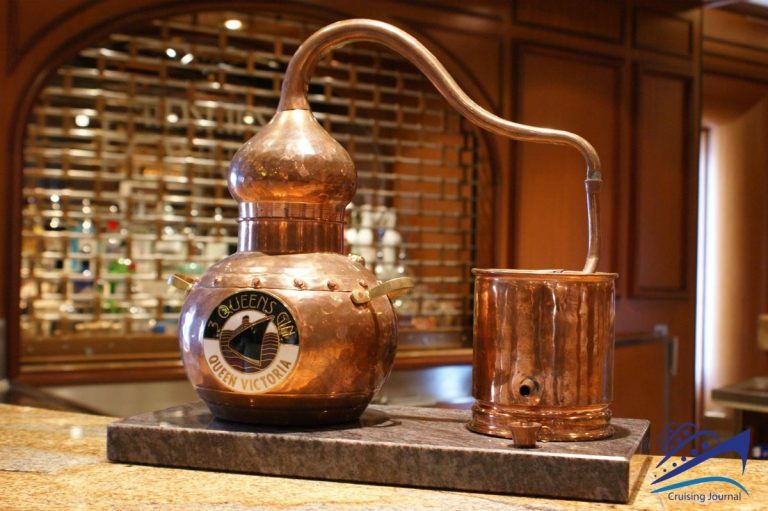 A previous collaboration with Vieuve Cliquot continues to leave room for a variety of gin tasting, as well as an exhaustive list of cocktails. 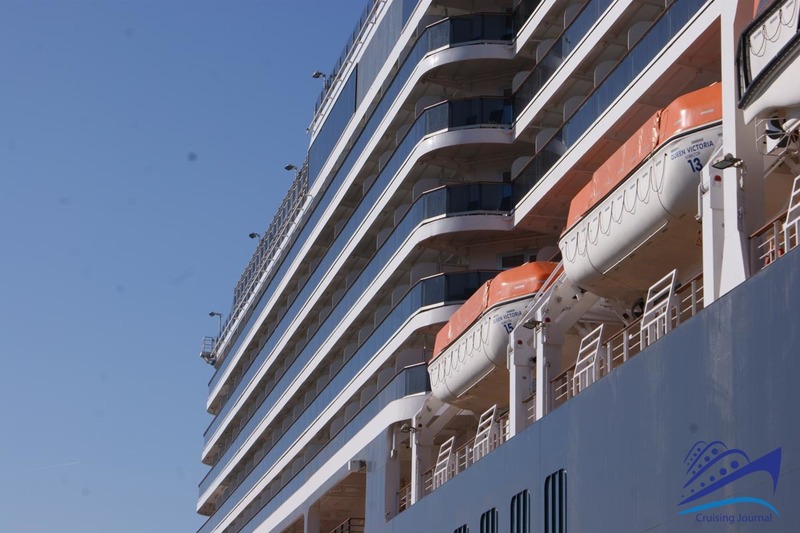 With its 1037 cabins and over 90,000 tons in weight, the ship can certainly not be considered a small-sized one. 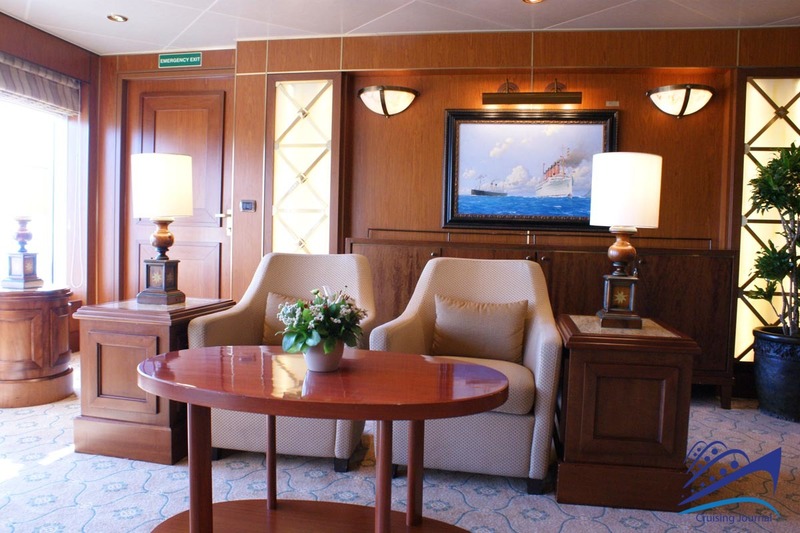 Regardless of its size however, it is still a people-friendly environment and after only a few hours on board, the guests can easily find their way around. 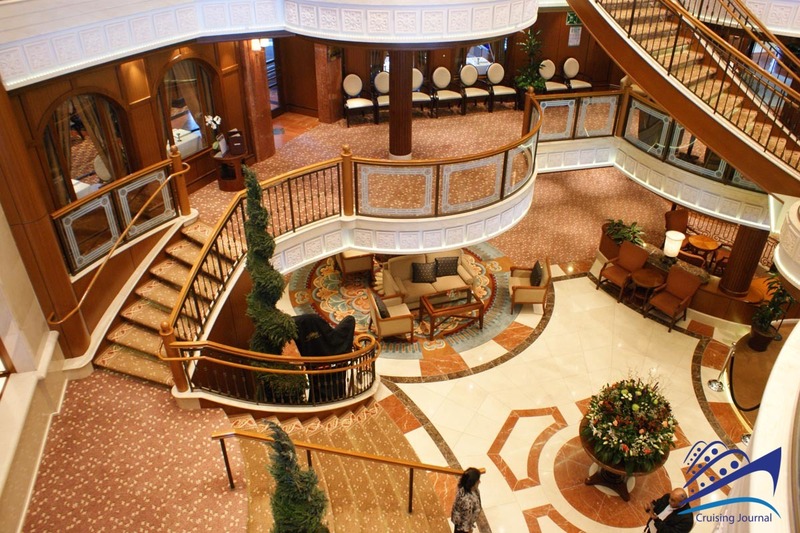 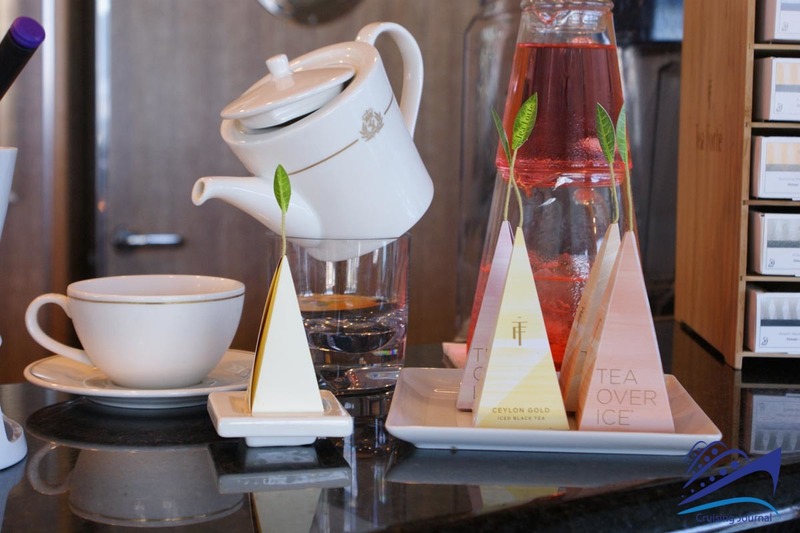 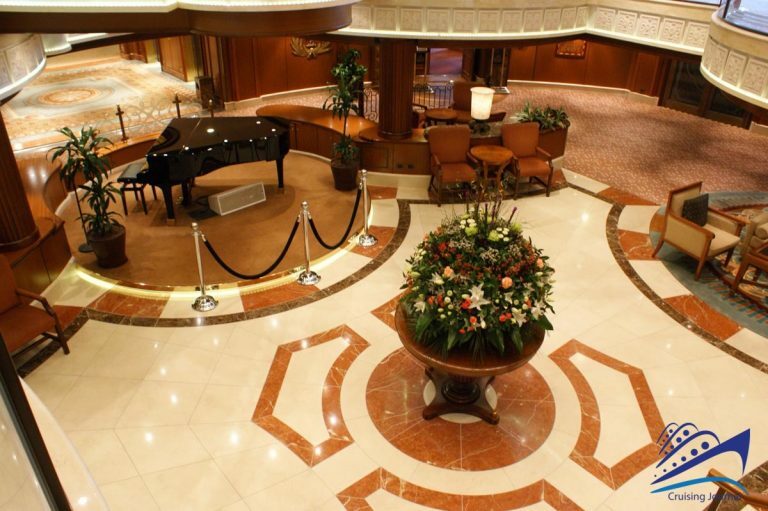 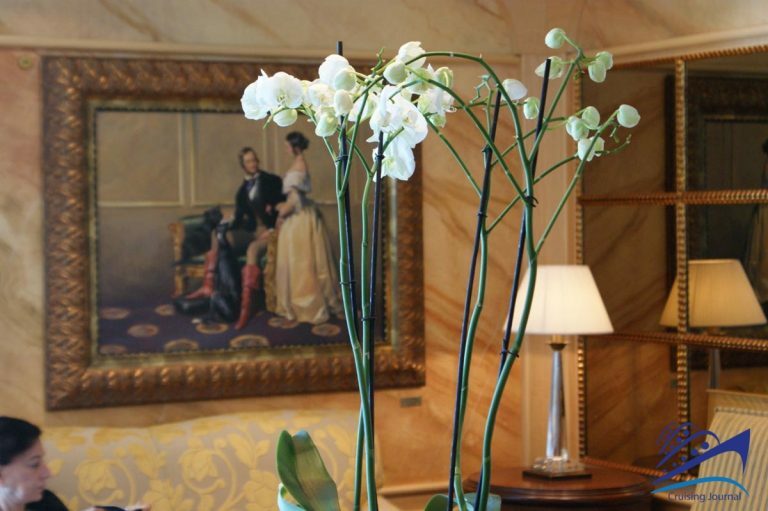 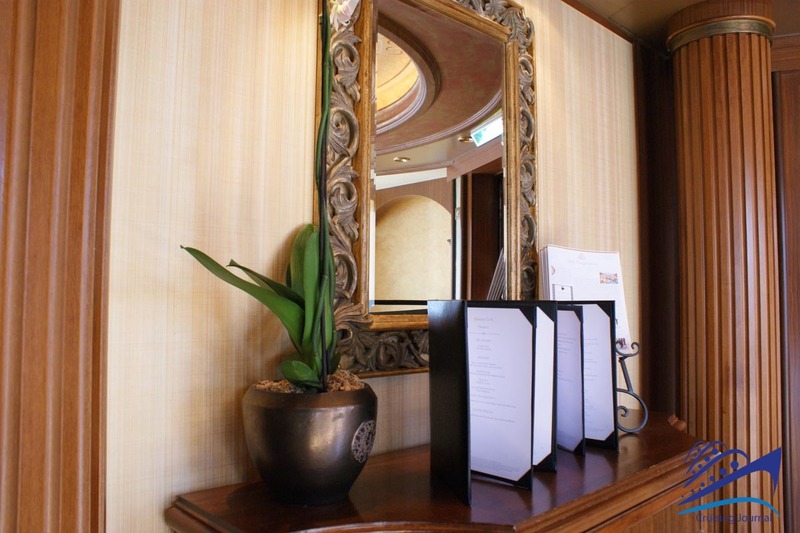 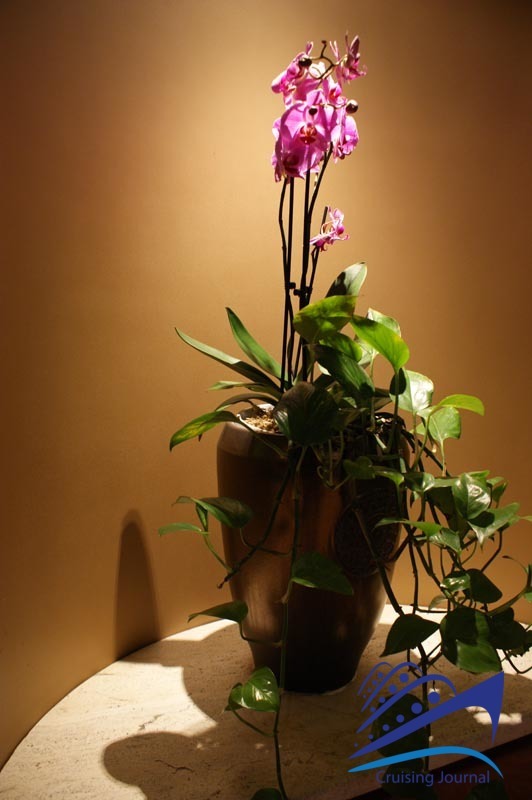 The Lobby is found at Deck 1 with its charming piano and the fresh flowers that adorn it daily. 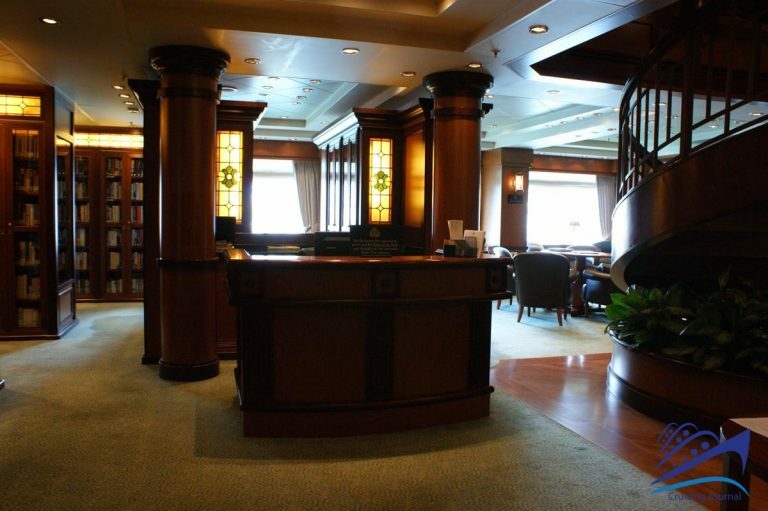 The Reception Desk and Excursion Office are located there. Connexia, which has access to the Lobby, is more than just a simple Internet Center: you can take actual computer lessons there and learn how to use tech devices. 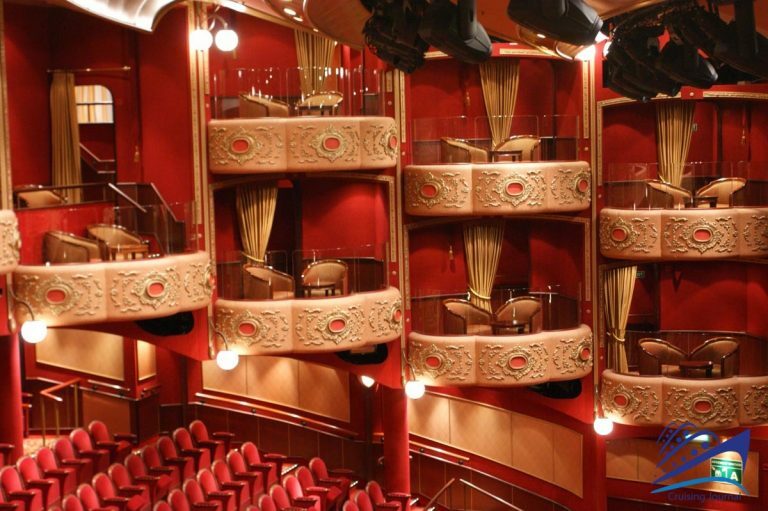 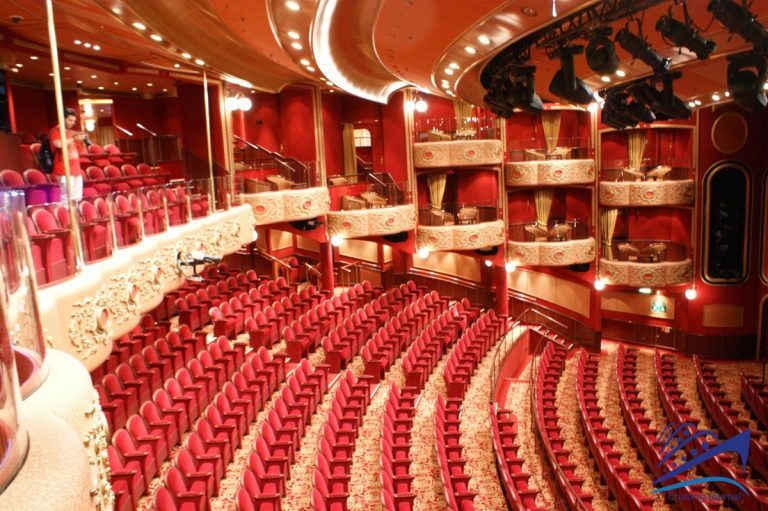 Going towards the bow you will find one of the three accesses to the Royal Court Theatre an extremely fascinating venue dedicated to vaudevillian shows as well as many other entertainment options. 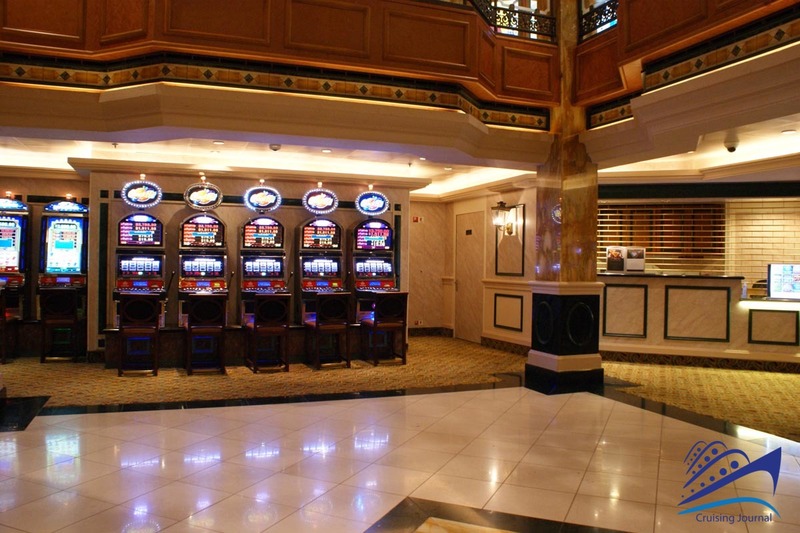 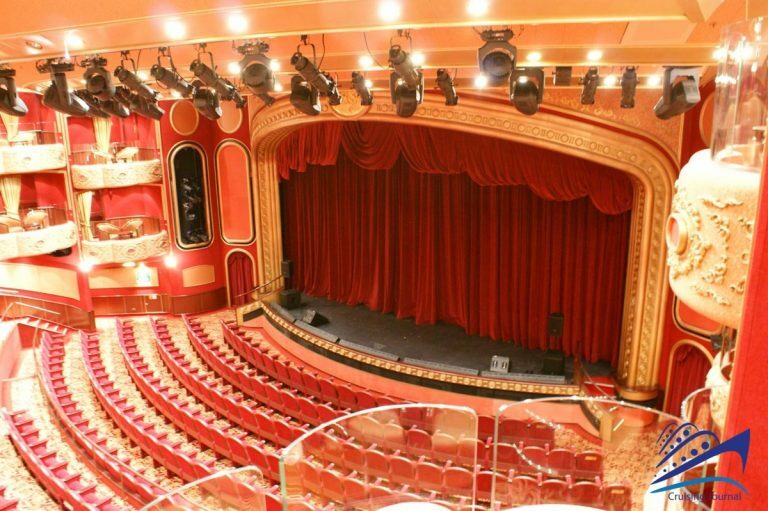 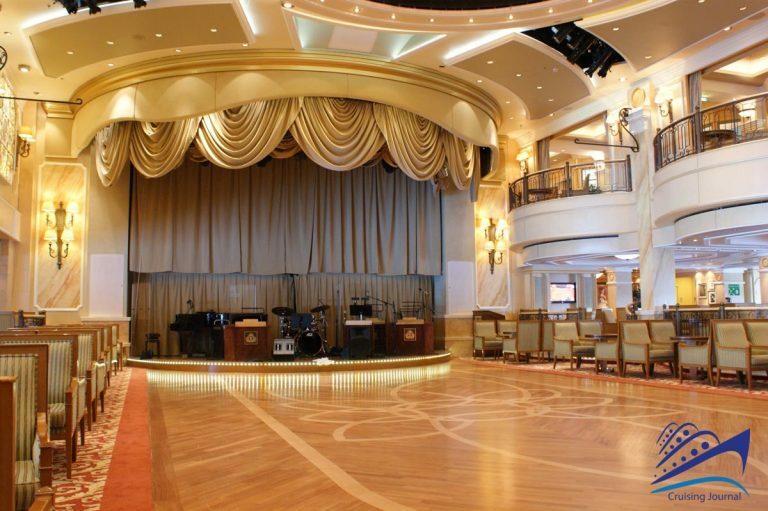 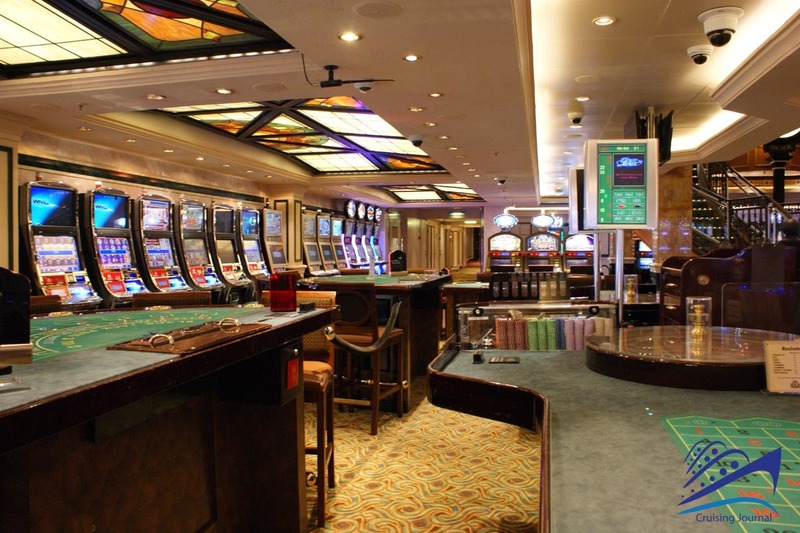 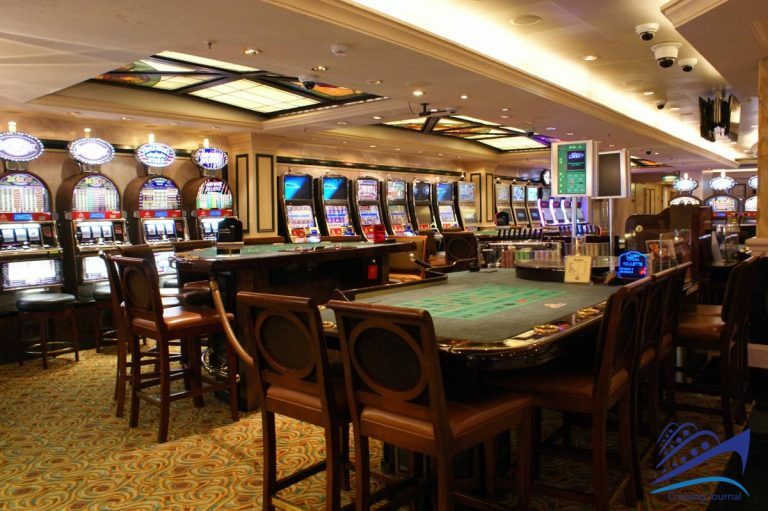 At Deck 2, you will find the theatre stage and just beyond the exit, the Casino with its slot machines and card tables, and the charming Golden Lion Pub, with its piano bar and karaoke evenings, and where you must absolutely try the fish and chips. 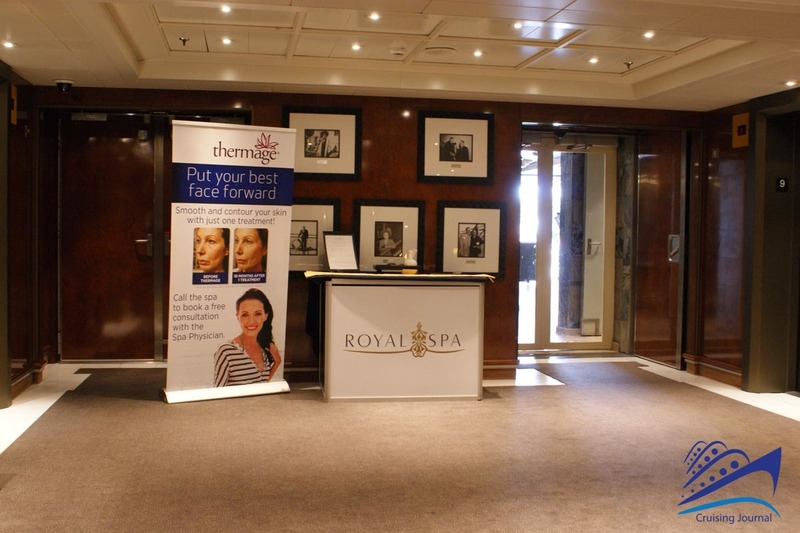 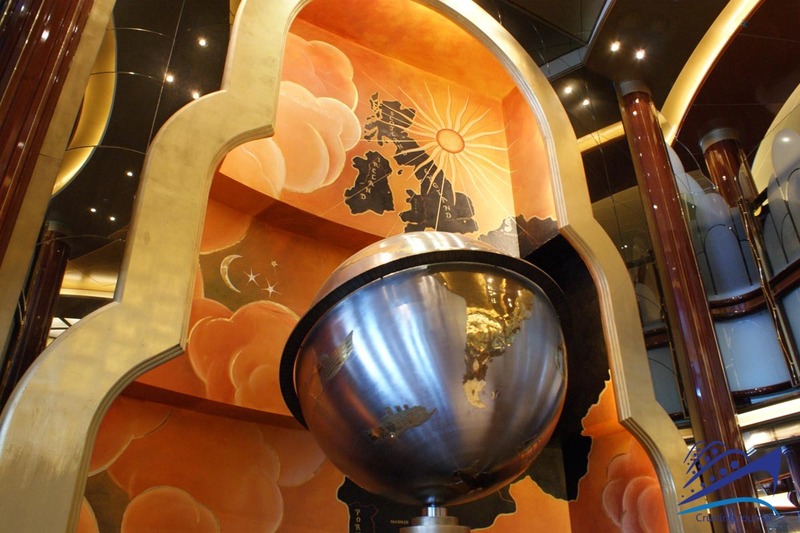 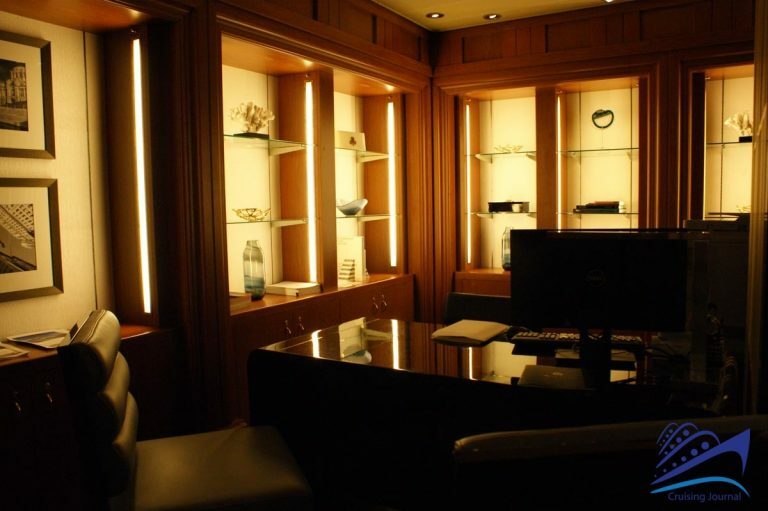 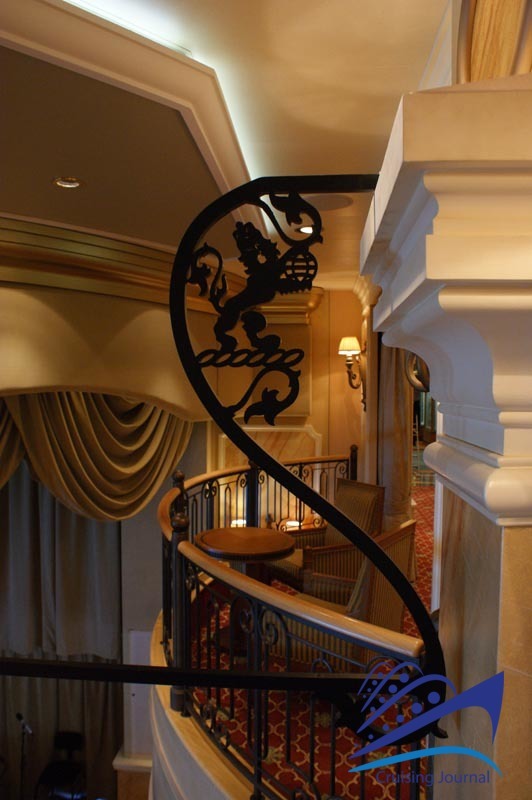 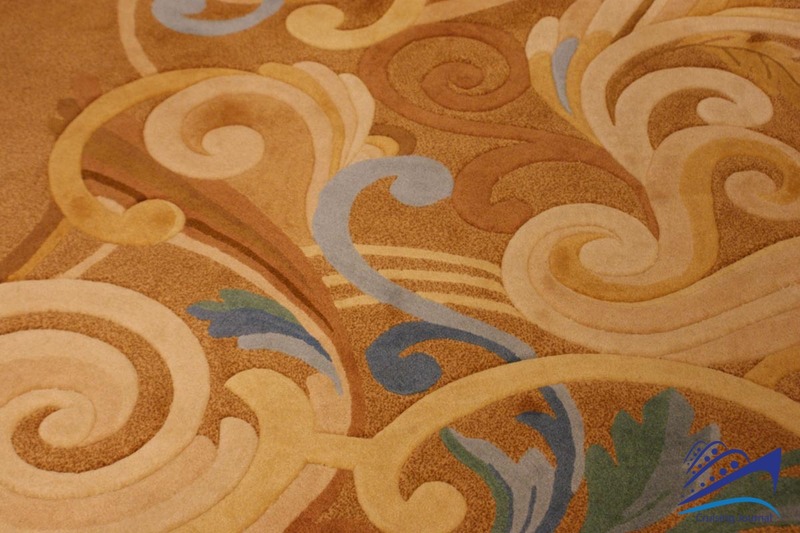 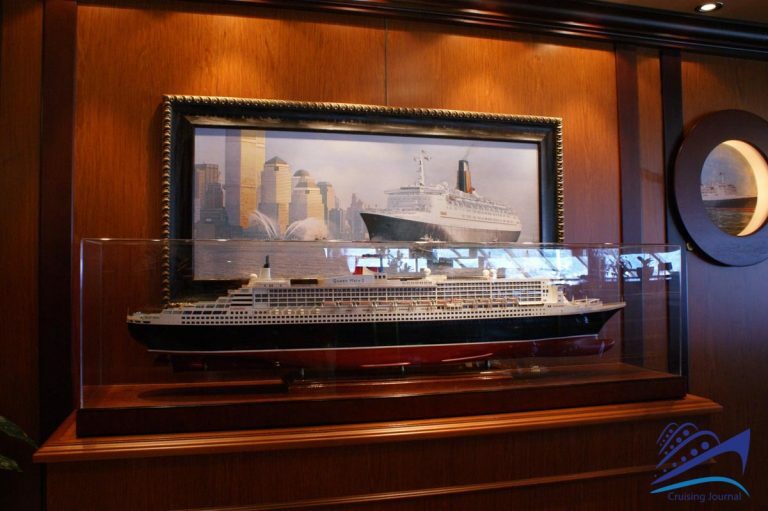 Further ahead you will find one of the most famous and beautiful areas of the ship, the Queen’s Room. 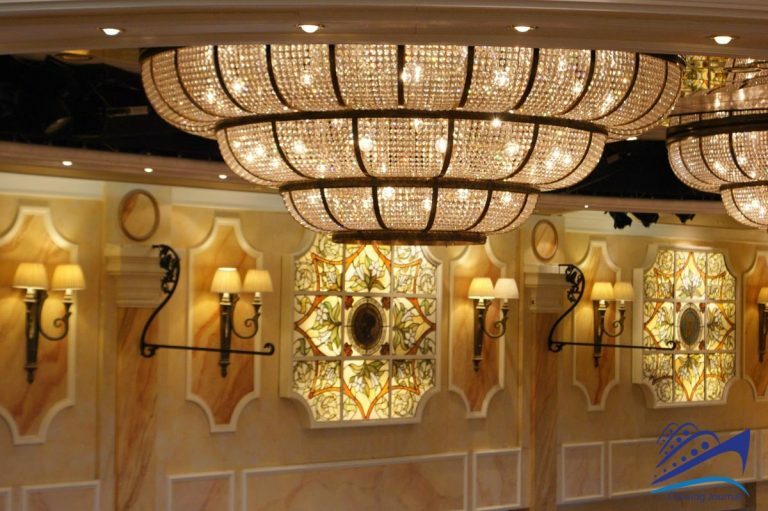 This elegant hall hosts a number of activities: from fencing lessons in the morning, afternoon tea, to elegant ballroom events. 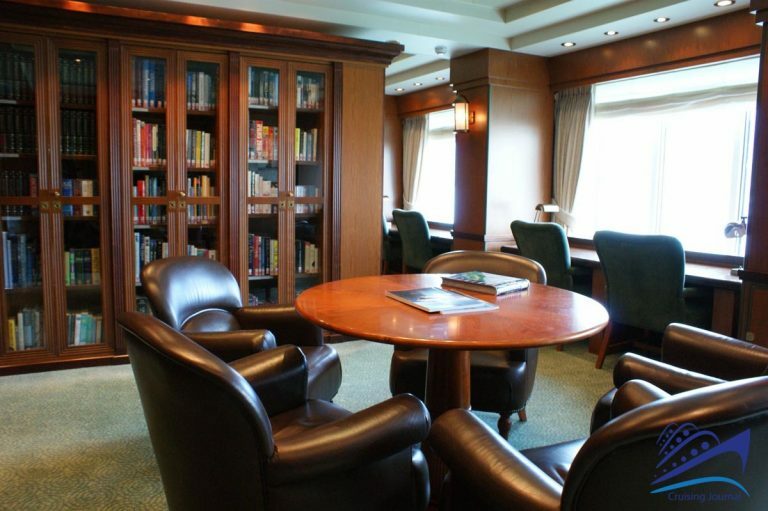 Following Deck 2 towards the center of the ship, you will find the famed Library, without a doubt one of the grandest and most beautiful to be found at sea. 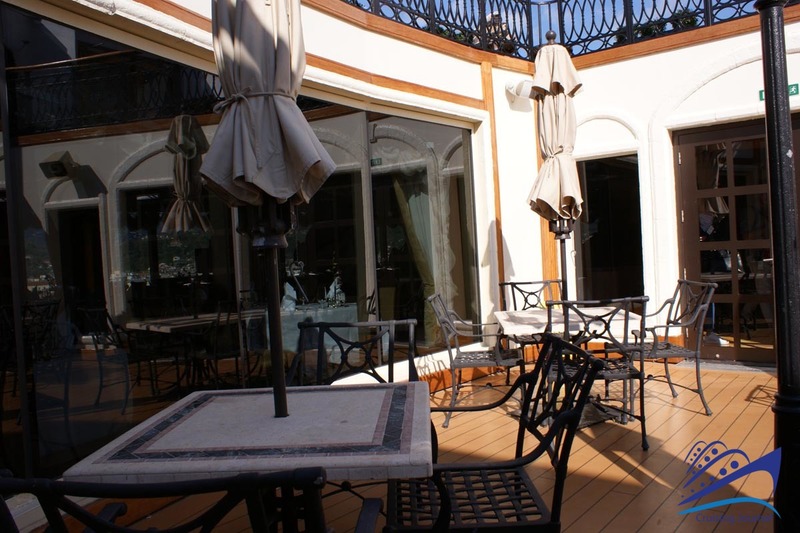 Next to it, there is the Verandah Restaurant whereas on the other side of the balcony overlooking the Lobby, you will find the newly renovated Café Carinthia. 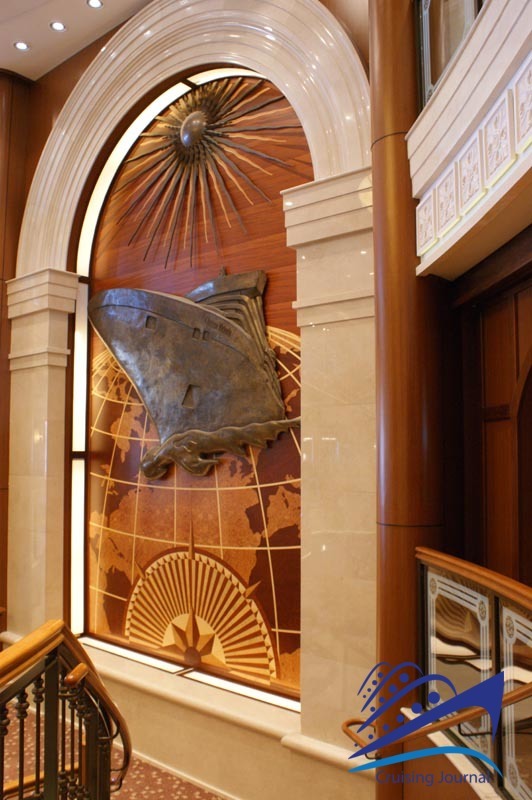 Continuing towards the stern of the ship you will find the Britannia Club and Britannia restaurants. 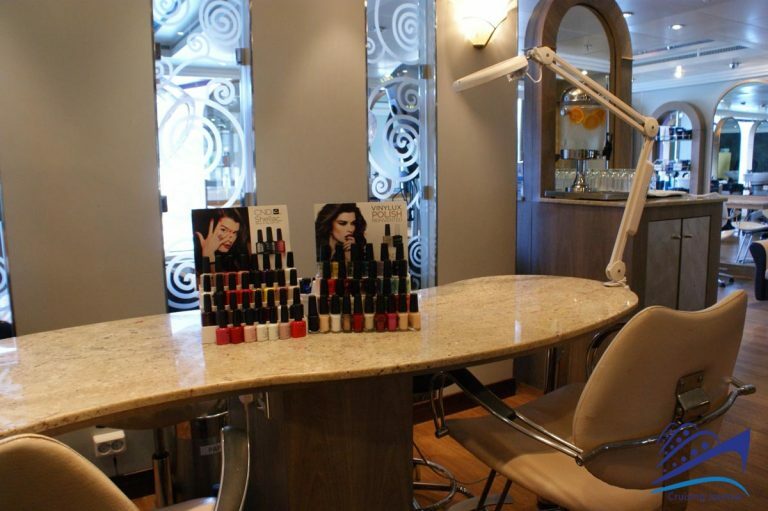 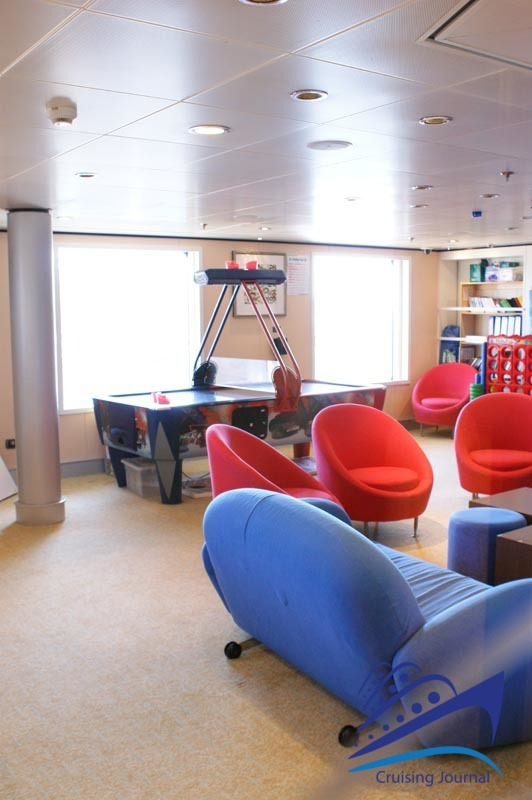 Deck 3 is also home to a number of facilities for the guests. 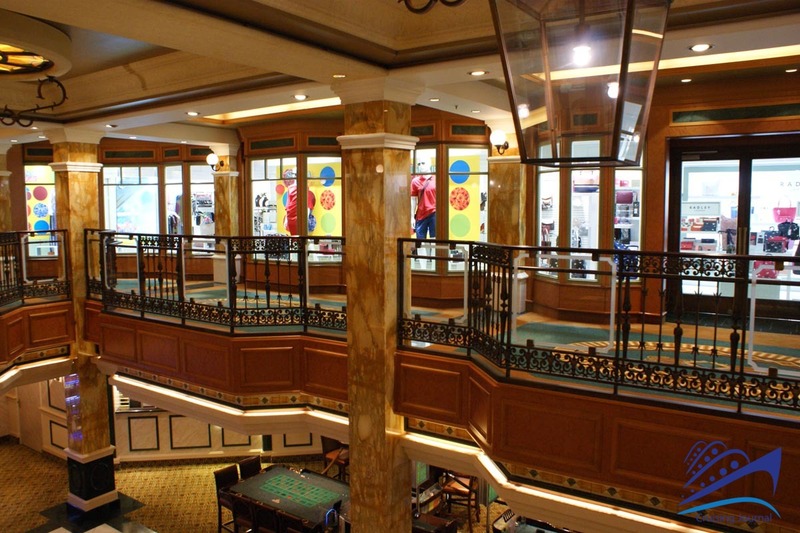 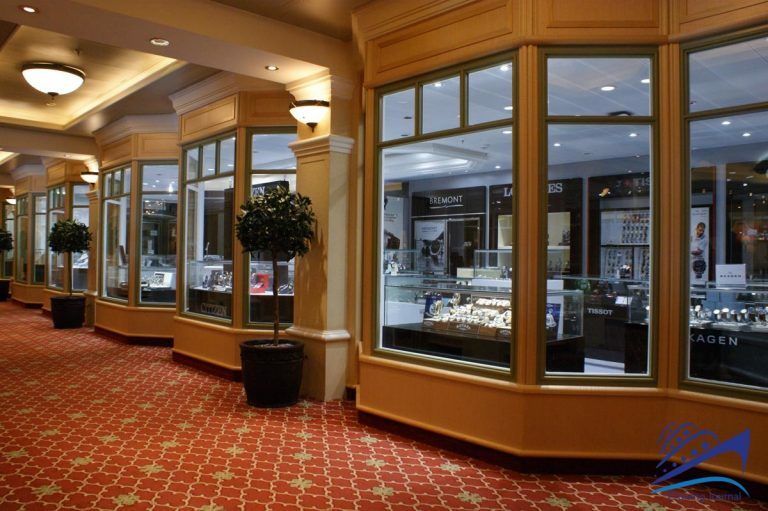 The Theatre gallery is found there and moving on you will find the shopping hub. A number of shops from clothing, perfume & cosmetics, to jewelry, overlook the Casino and lead to the balcony over the Queen’s Room. 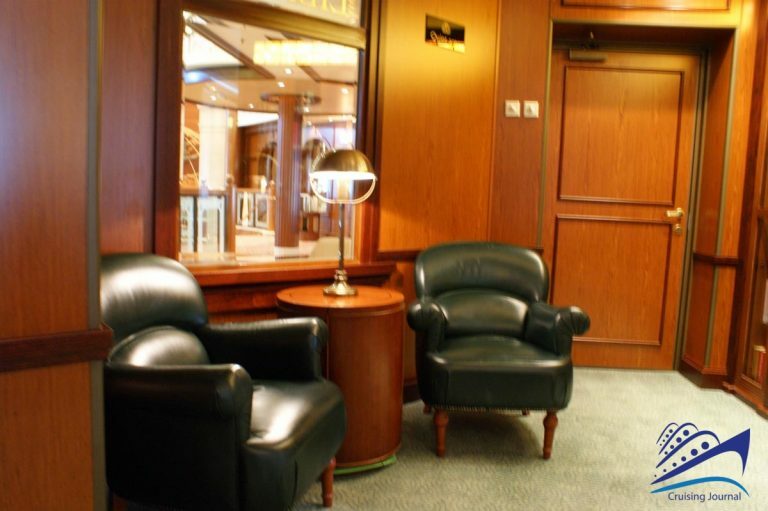 Crossing the Cunardia Art Gallery you will find yourself once again on the third floor of the Lobby. Inside the charming Bookshop, there are many books about navigation and the history of the Cunard Line. 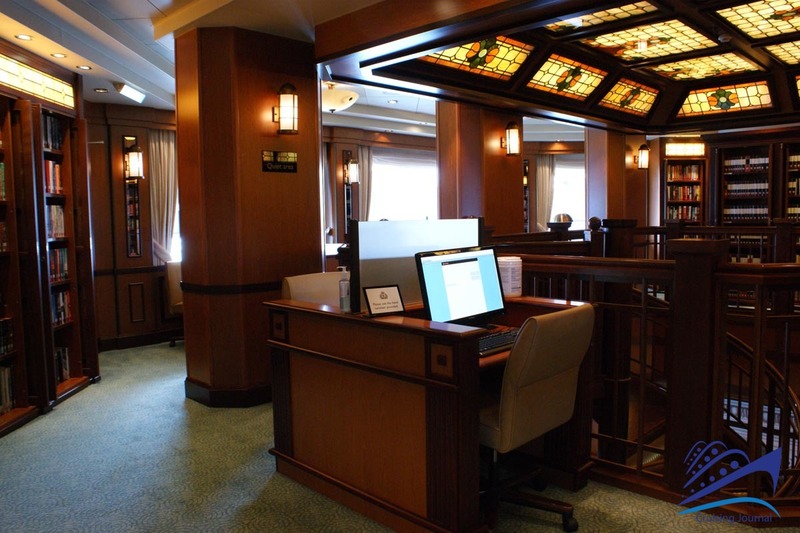 At the top floor of the Library, there are computers available for the guests to use. 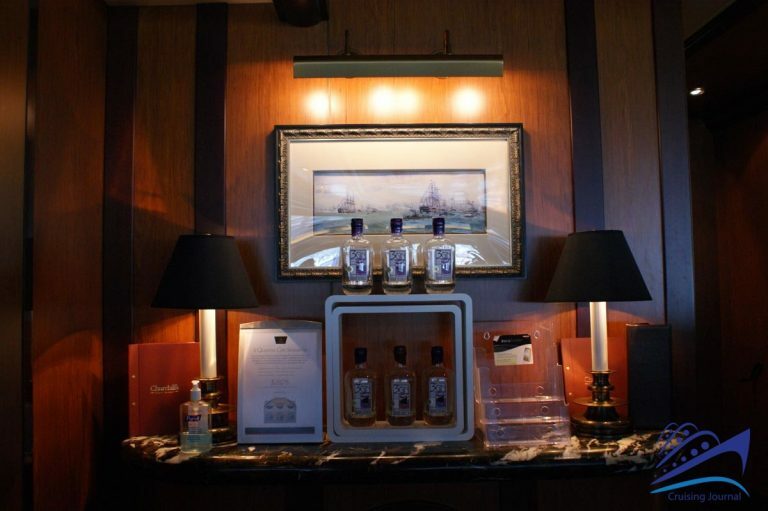 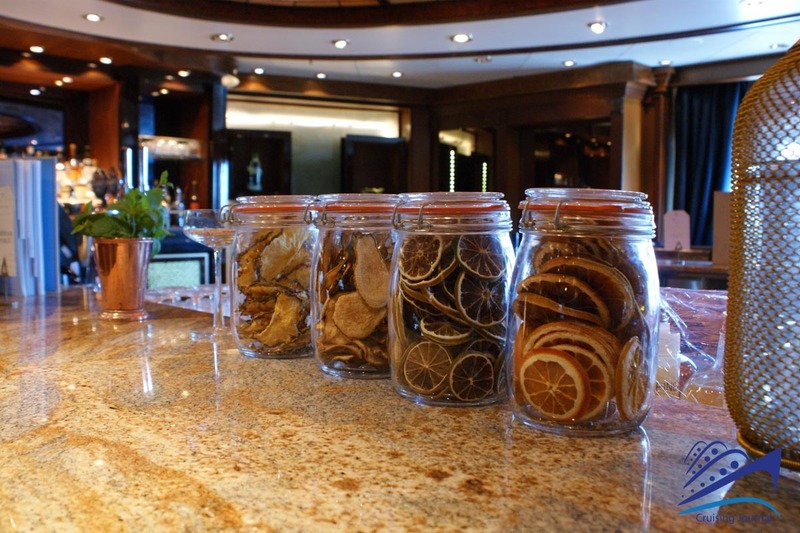 Right above, at the Café Carinthia, there is a new space dedicated to Gin with delightful tables that overlook the Lobby as well. 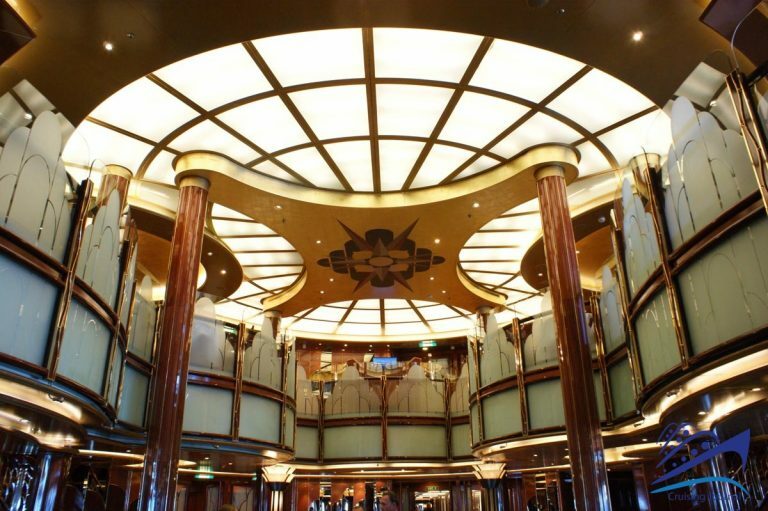 Continuing towards the stern you will find the renovated Photoshop, which in keeping abreast with contemporary tendencies now shows its photos only on large screens. 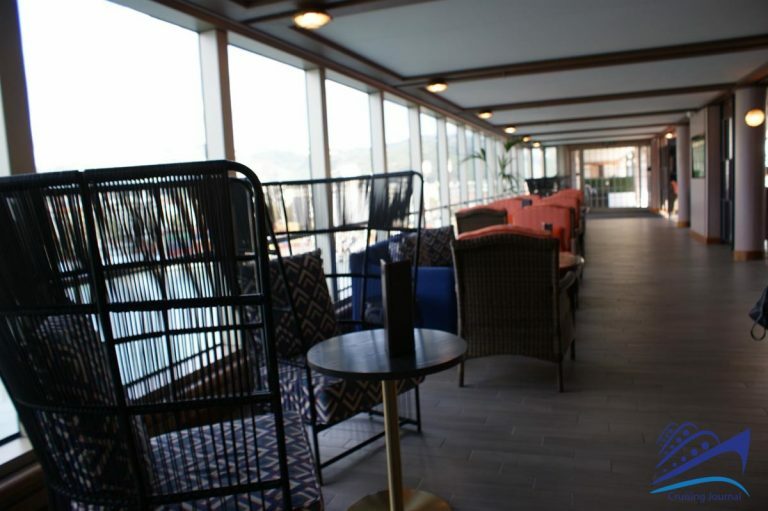 Deck 3 offers an exquisite exterior promenade furnished with elegant blue armchairs that let you enjoy the navigation in a quaint setting of days gone by. Going up to Deck 9 you will find public areas. The Winter Garden also renovated in 2017 is another jewel in the crown of the Cunard fleet. 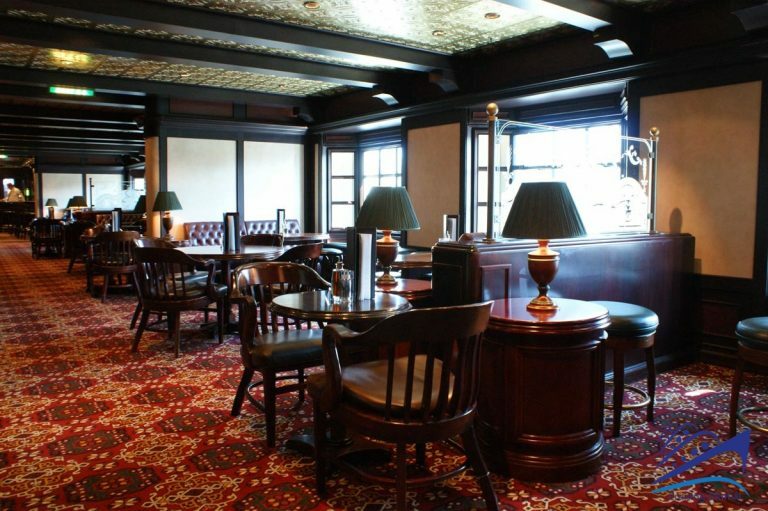 There you can relax and read in the afternoon, have a pre-dinner drink, listen to live music, or watch a soccer game in the evening. One side opens up to the Lido Restaurant buffet set up in various stations offering different foods such as pasta or pizza. 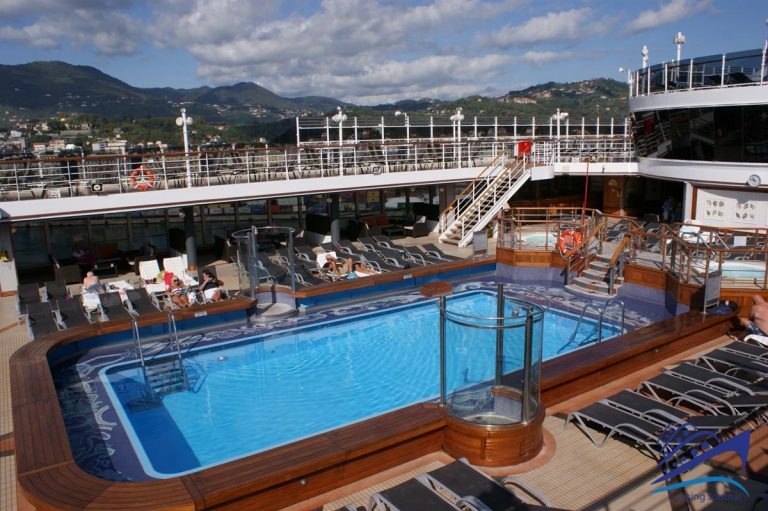 This leads on to the stern-side pool reserved solely for adults. 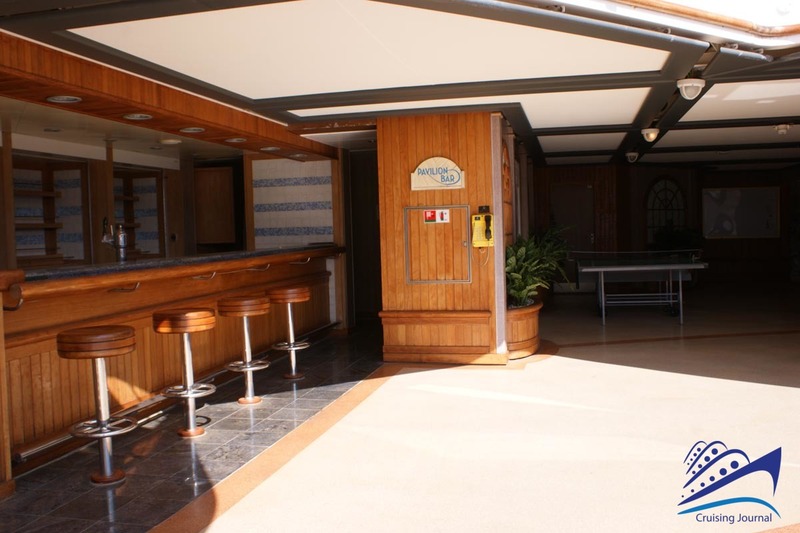 This area includes a bar and a Grill usually open until late afternoon. 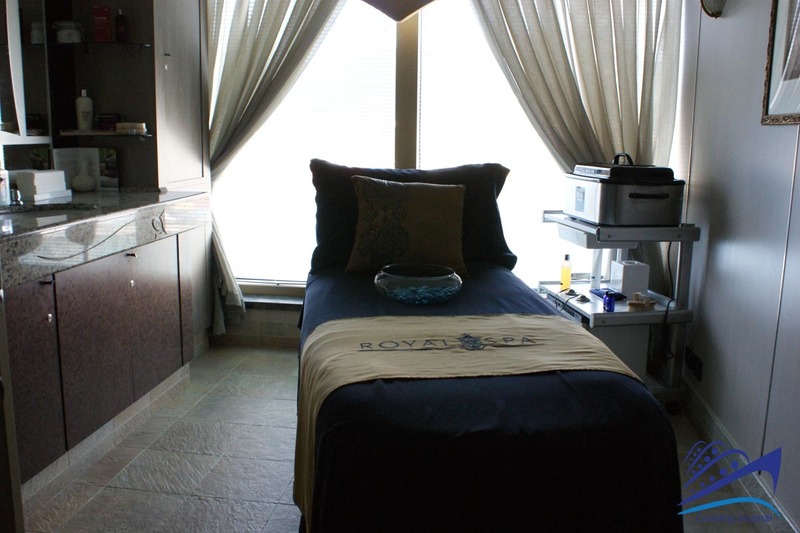 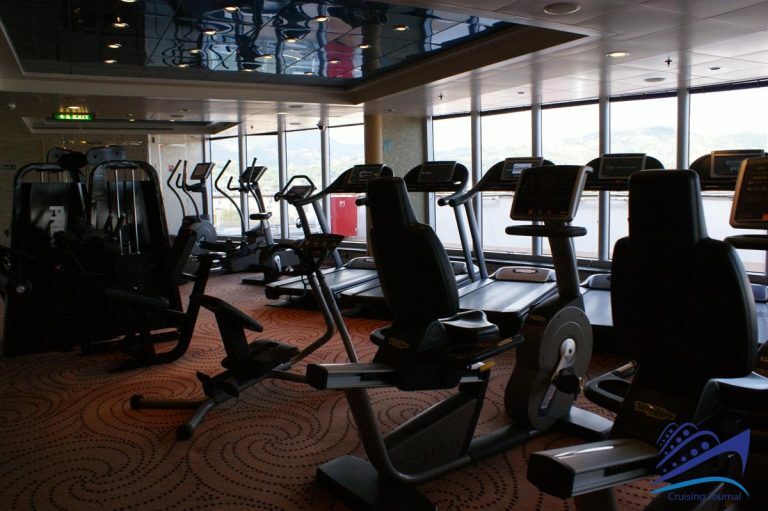 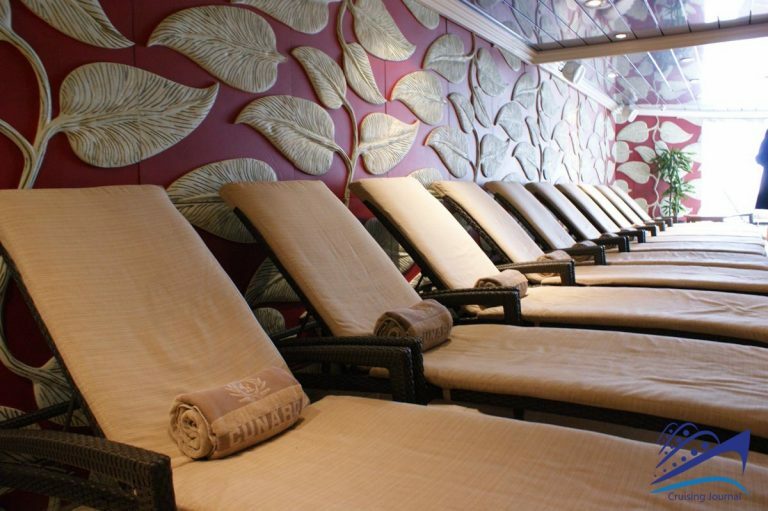 The Spa and the gym are also found on Deck 9 in the bow area. 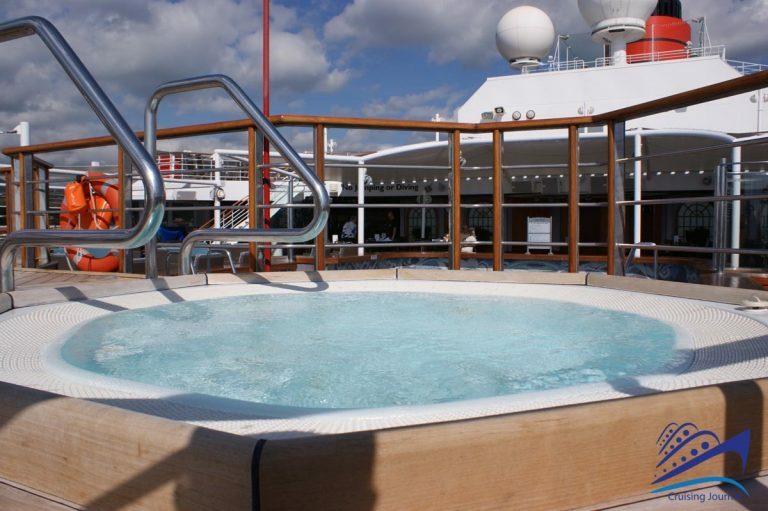 Do not miss out on the Hydropool, a large pool with water jets and hydro massage overlooking the main pool. There is an entry fee and day passes or packages are also available for purchase. The gym is fully equipped with modern fitness equipment and there is no charge for use of the facilities. 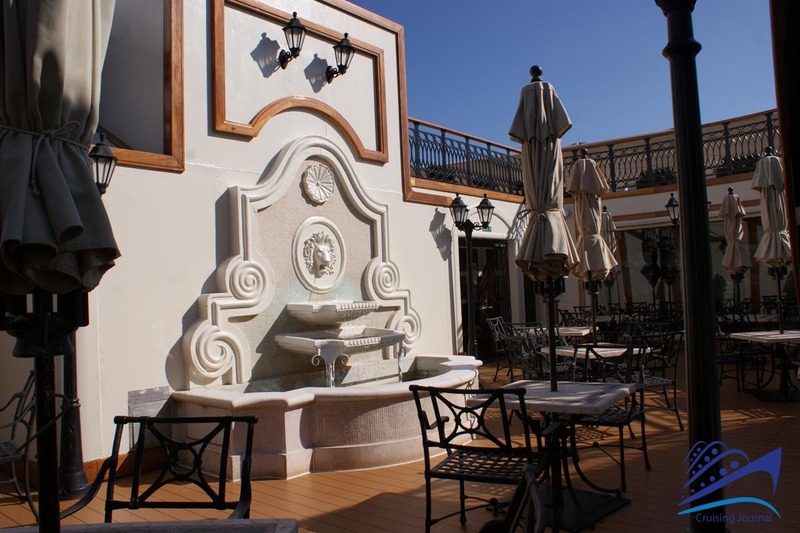 The guests have full complimentary use of the two Jacuzzi tubs located poolside in the main Lido with the Pavillon Bar nearby to serve you. 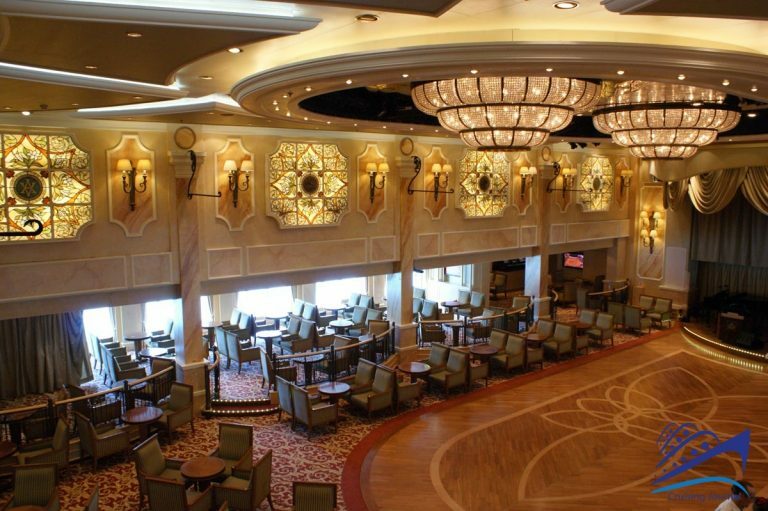 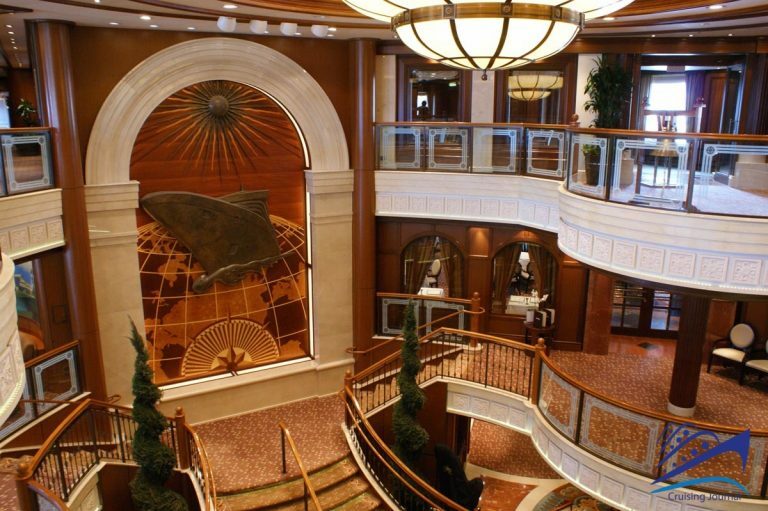 Going up to Deck 10 you will find the Commodore Club, which is just as appealing and cozy. 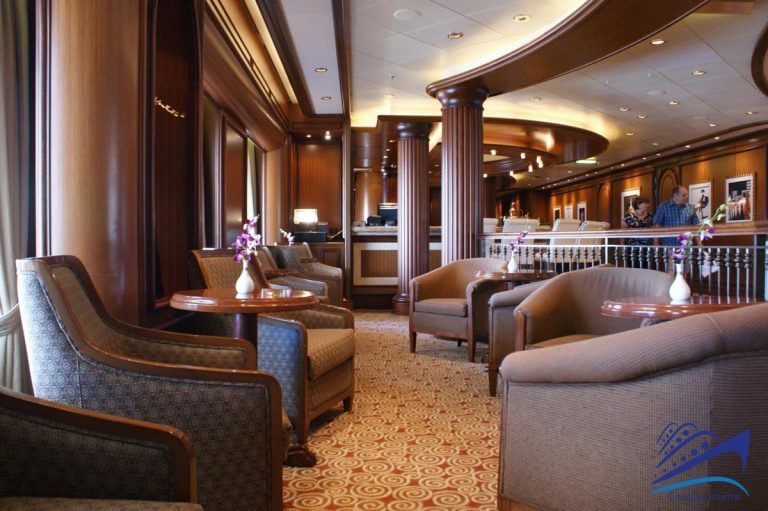 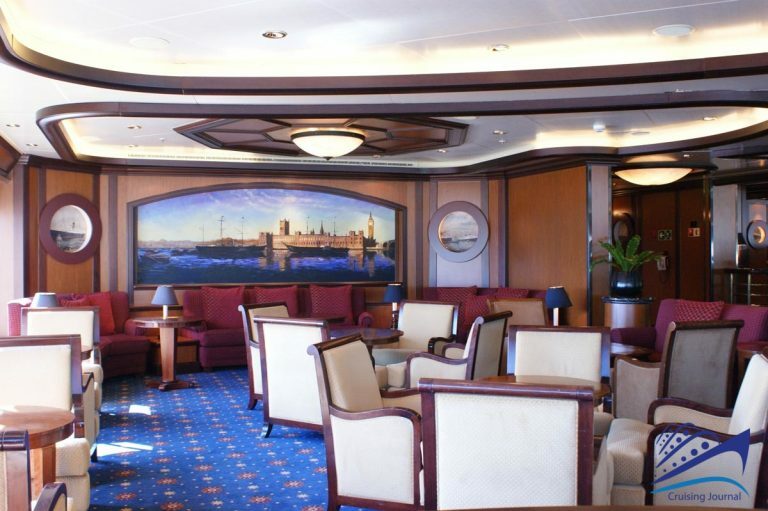 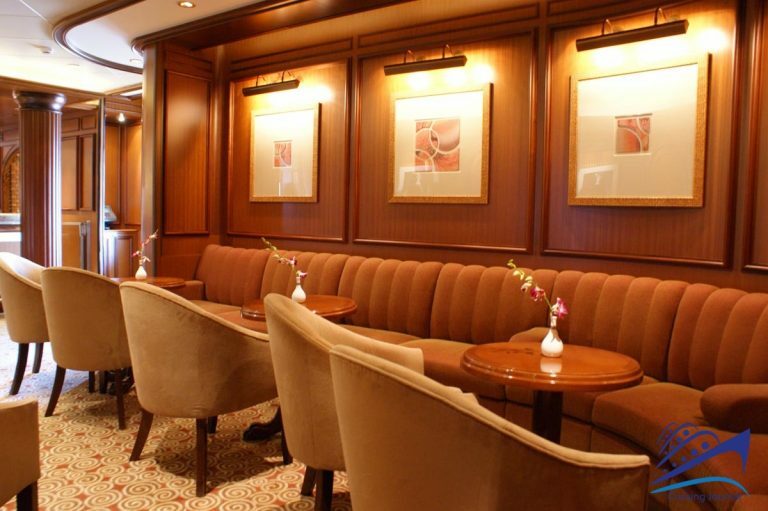 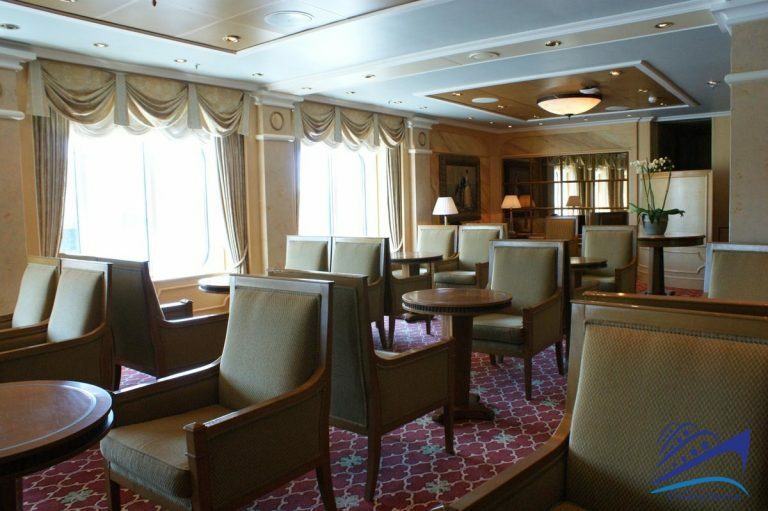 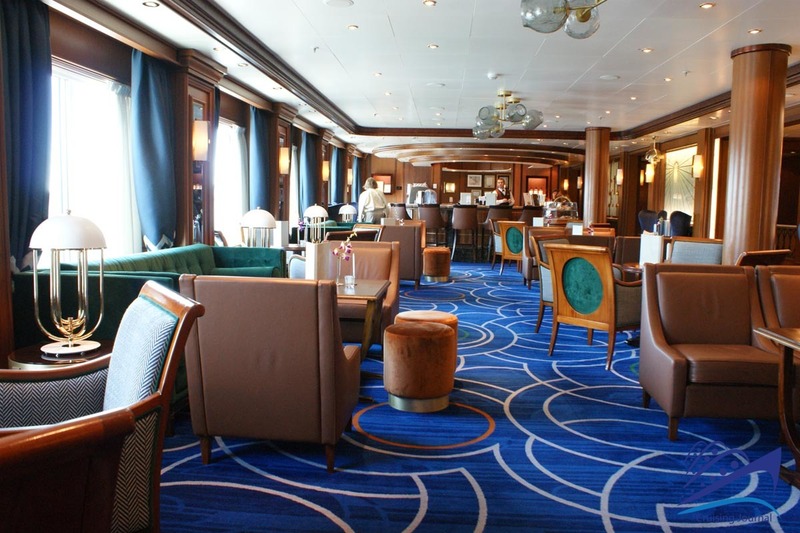 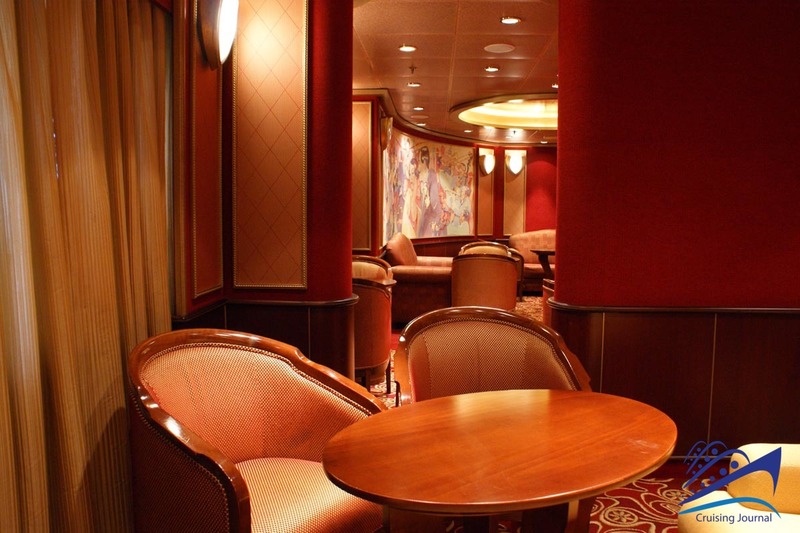 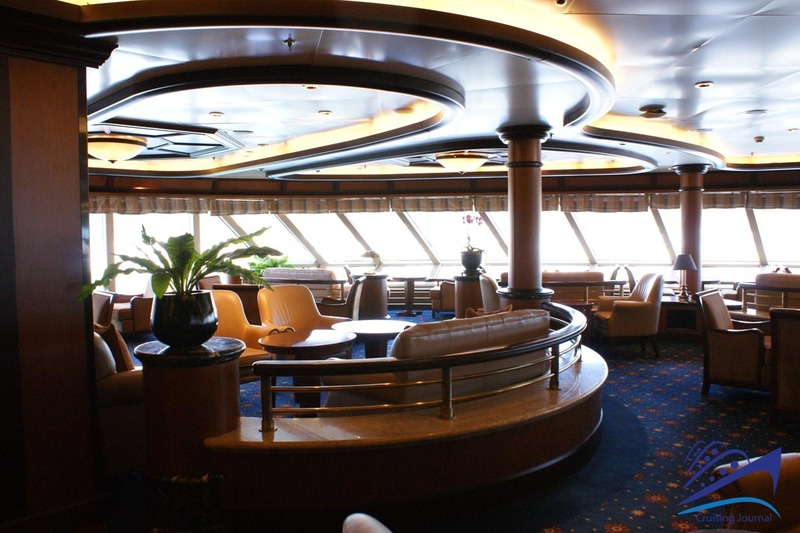 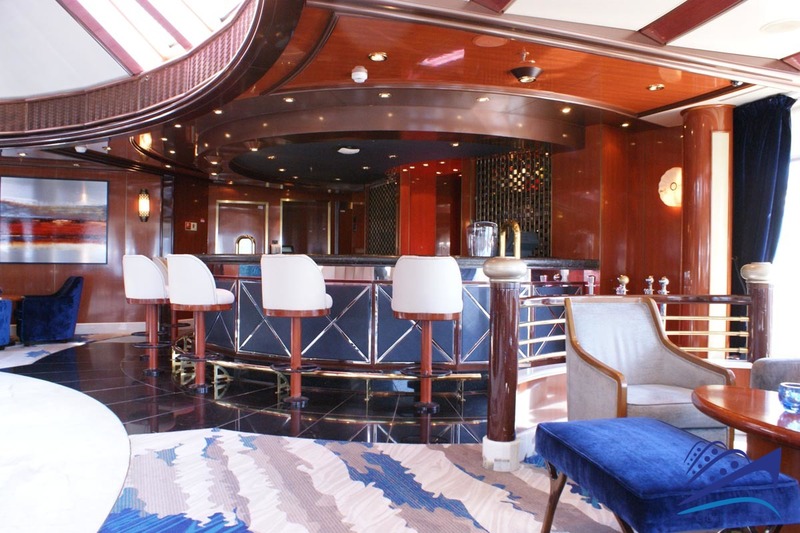 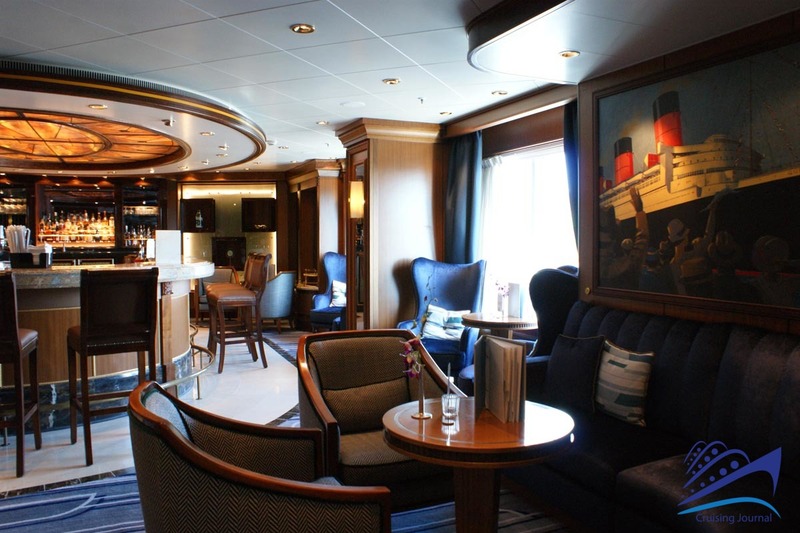 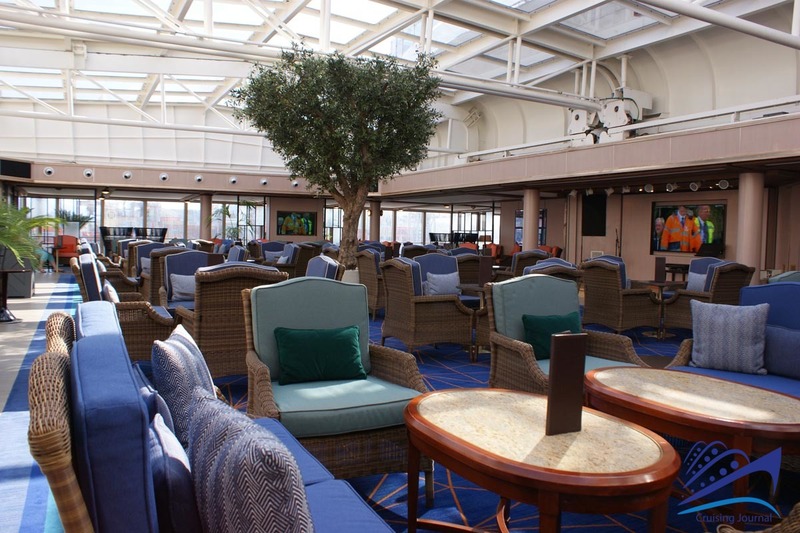 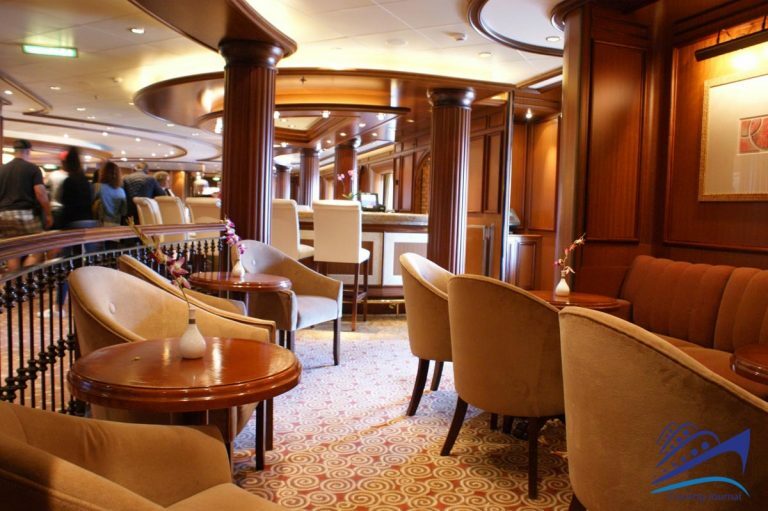 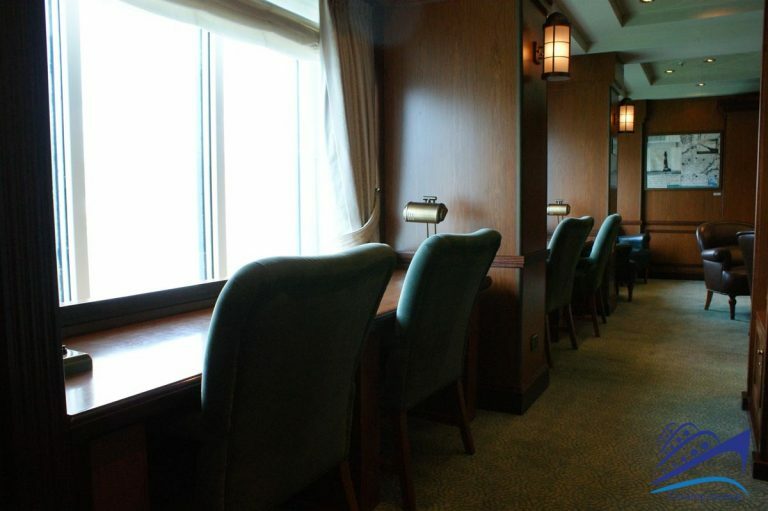 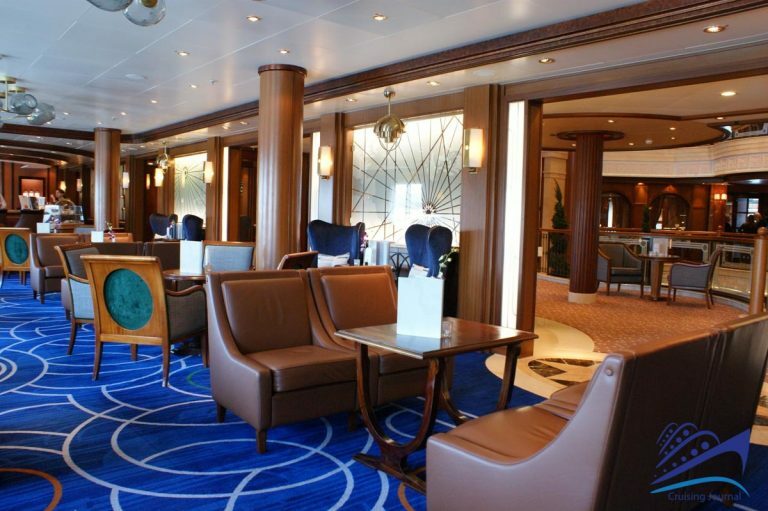 This lounge is located at the bow of the ship and offers a sea view that can be enjoyed from dawn to dusk. 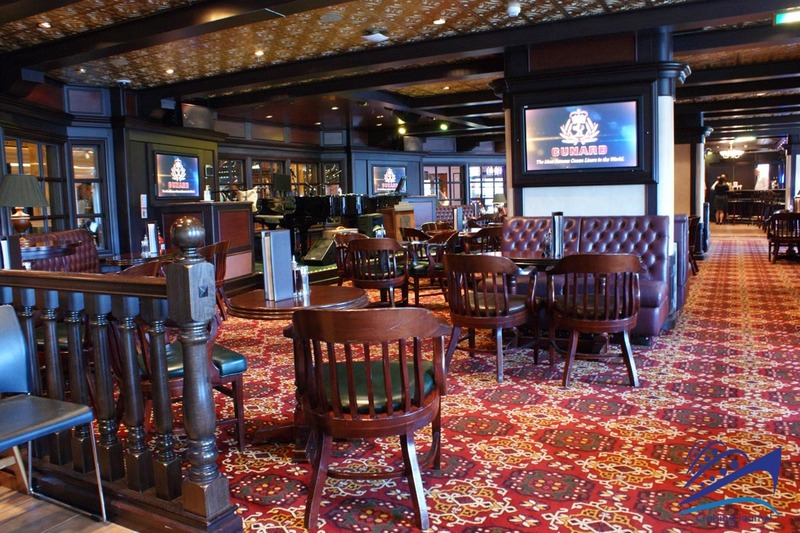 Nearby and still in the bow area, there is the more vibrant Atmosphere, a discotheque that also offers live music, jazz, etc. 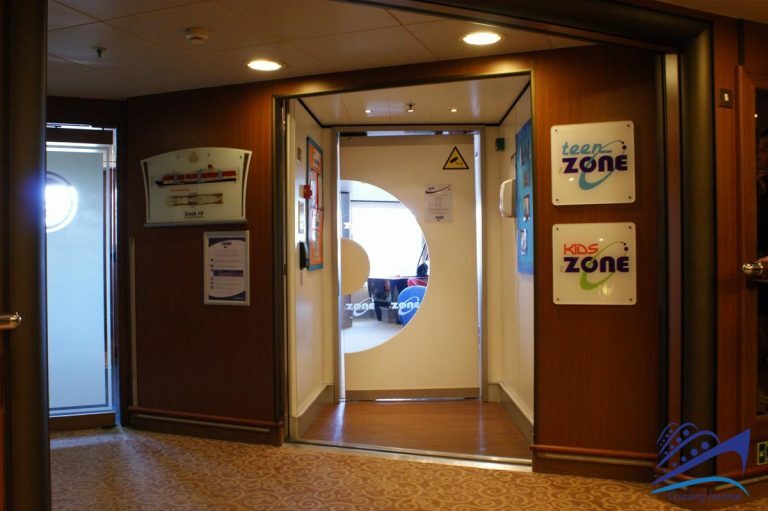 The younger children onboard will find dedicated play facilities, both indoor and outdoor, at the center of the ship: The Zone and The Play Zone. 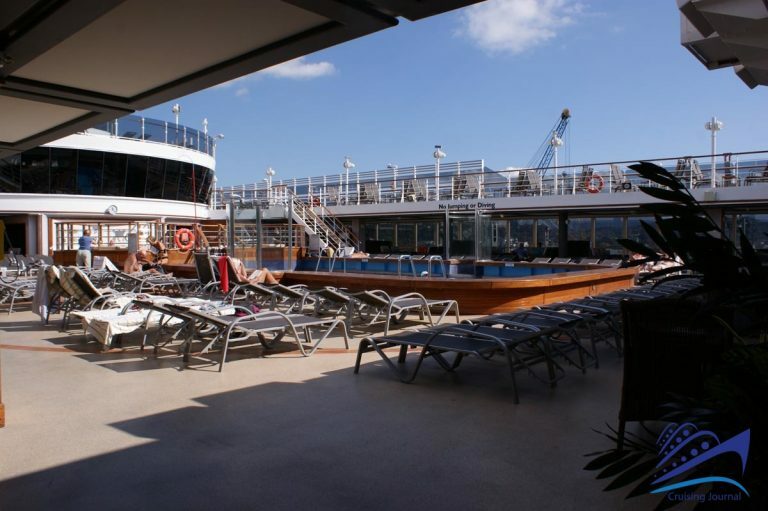 The sports facilities are at Deck 11, with an all-purpose court on bow-side along with other games facilities such as a bocce ball court. 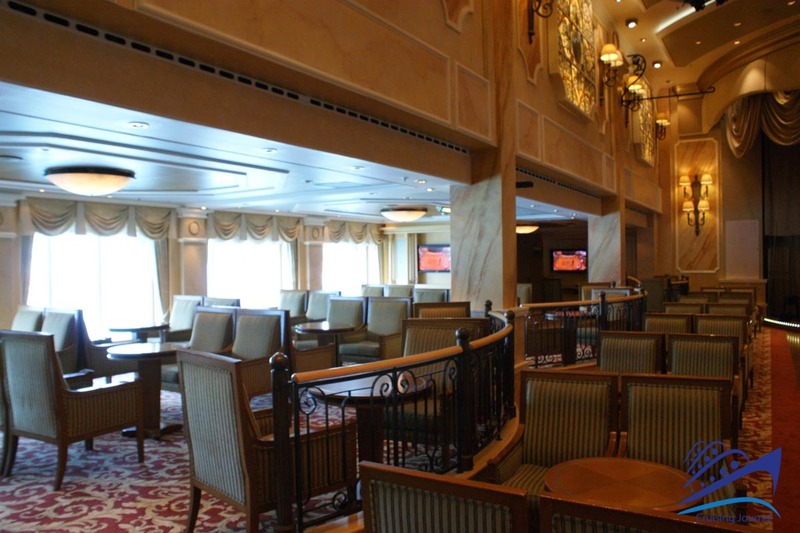 The area reserved for the Grill Suites is “hidden away” in the center of the ship. 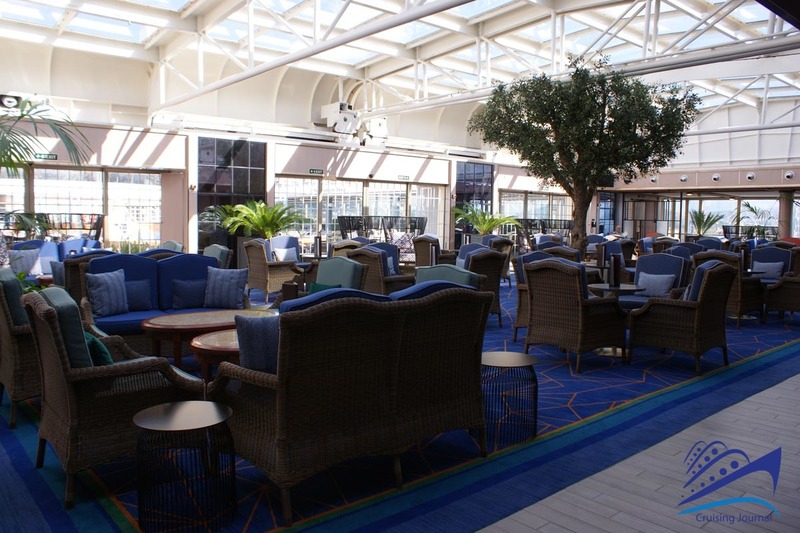 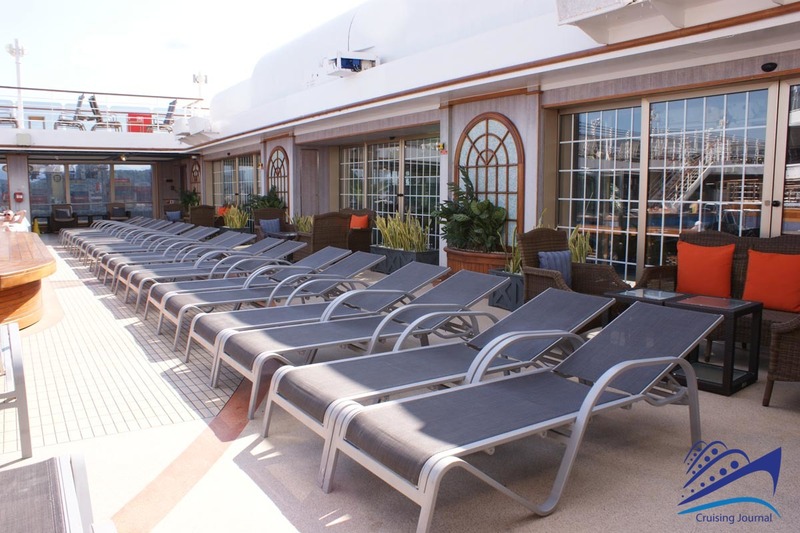 There are two restaurants, a Lounge and outdoor areas that continue to the exclusive Solarium located at Deck 12. 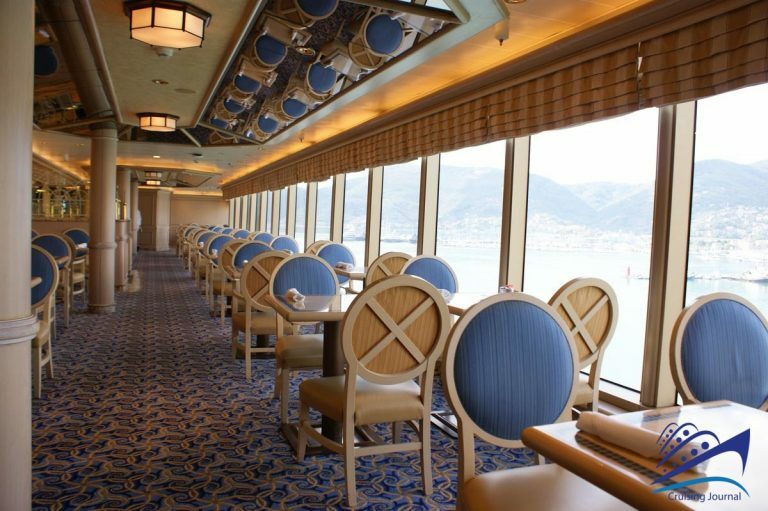 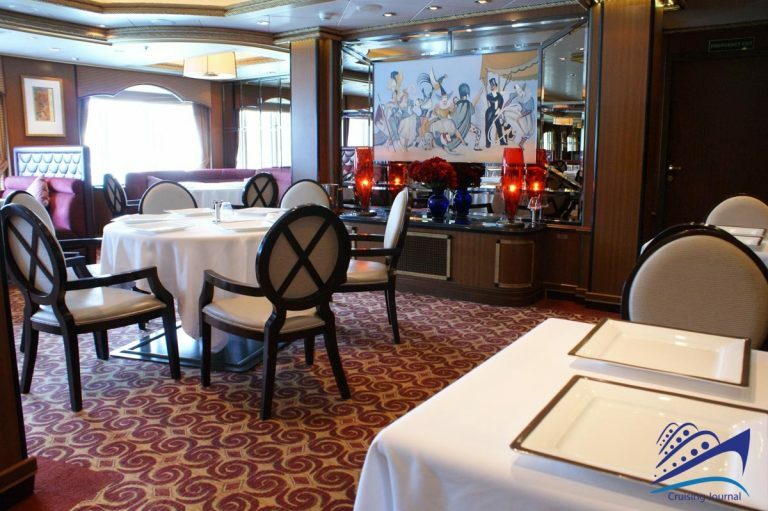 The dining venues on board are reserved according to the cabin category of the guests. 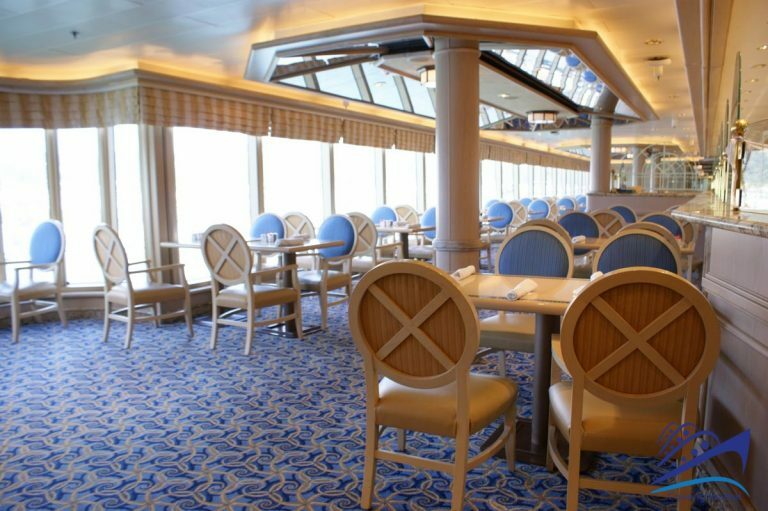 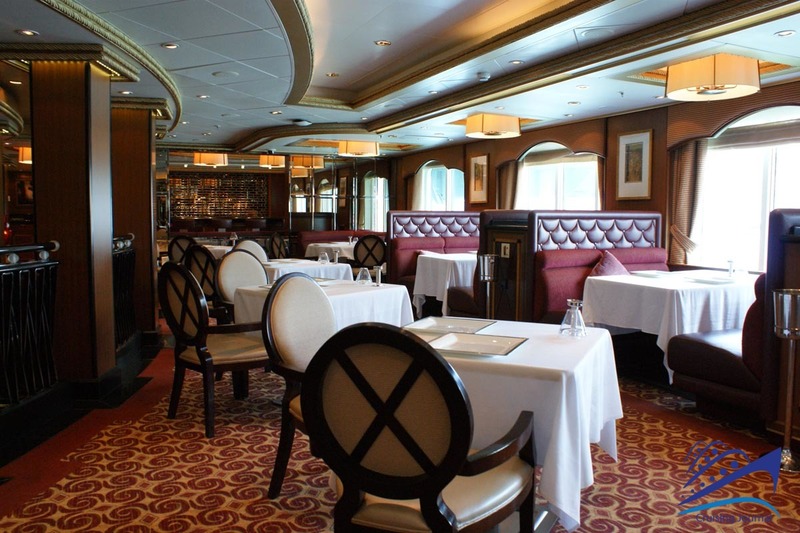 The Britannia is the main dining facility that operates at posted hours for the same-named cabin category, whereas the others have their own facilities with flexible hours. 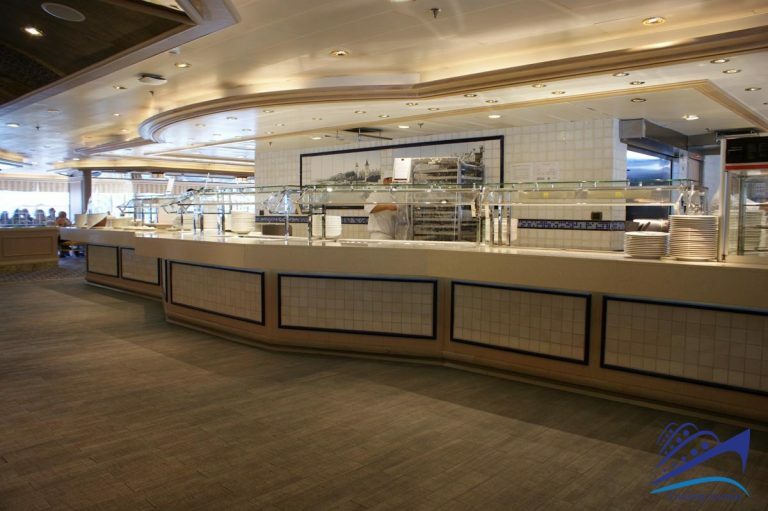 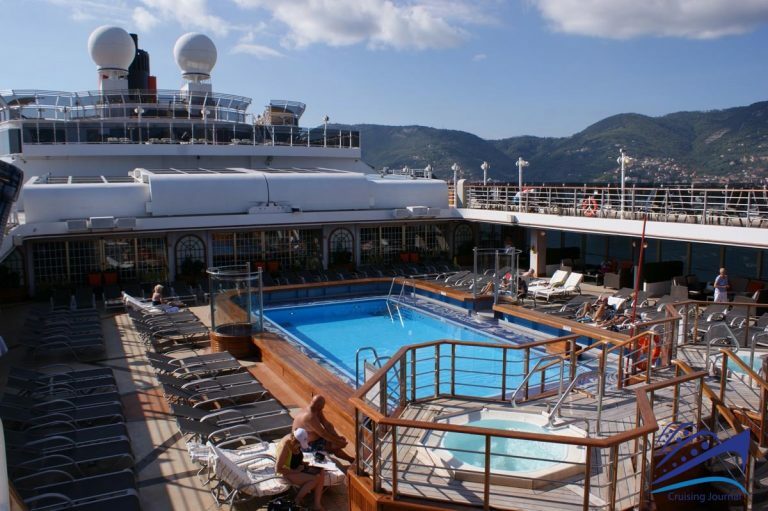 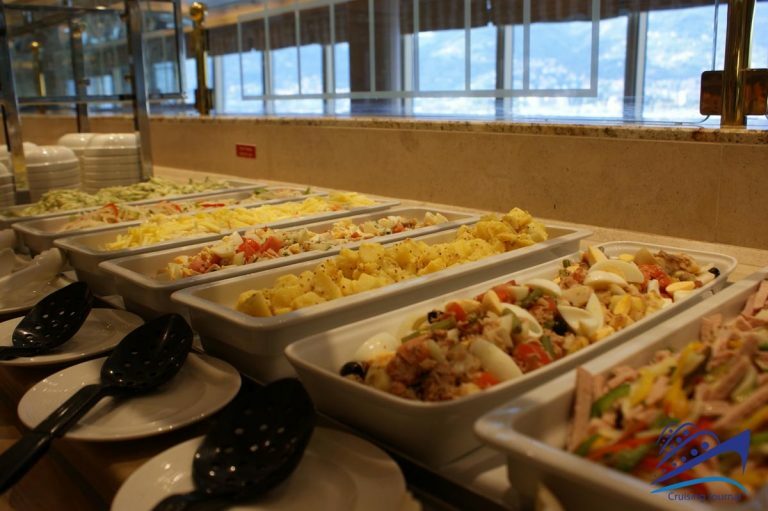 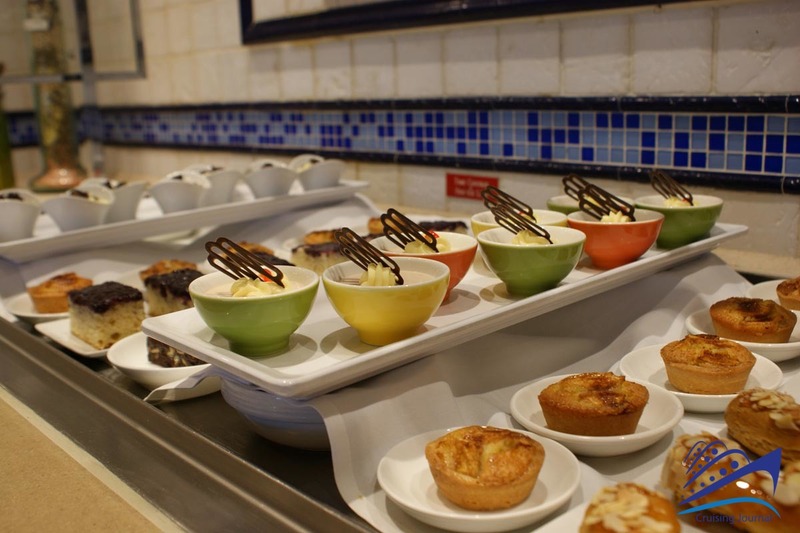 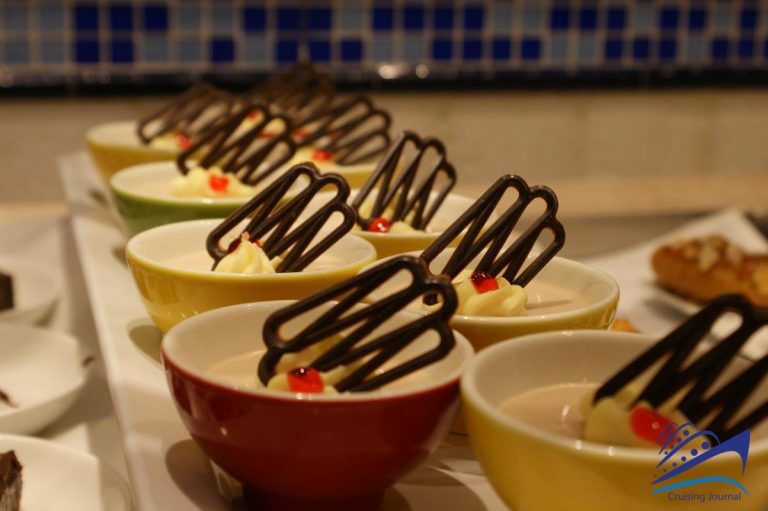 Alternatives to the dining facilities are the outdoor buffets set up on the Lido Deck, which have flexible hours and no dress code, and the stern-side Grill where you can enjoy panini, hamburgers and hotdogs. 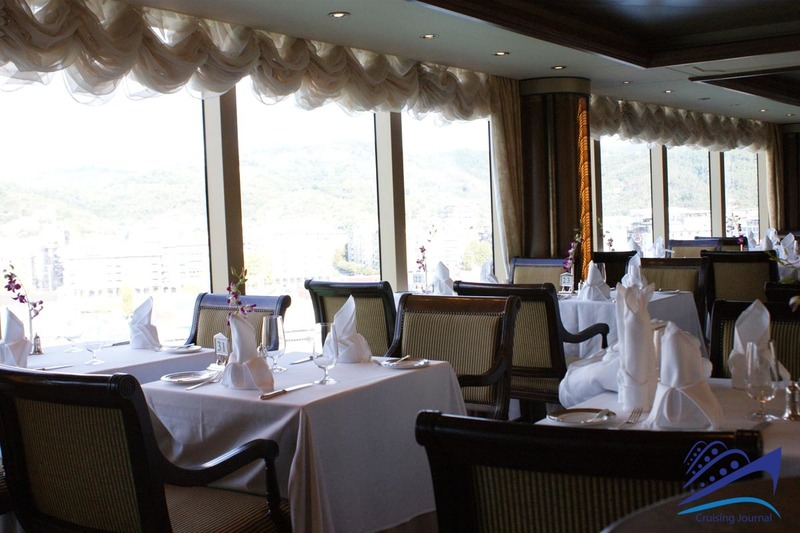 If it is French cuisine you are interested in, then the Verandah is the place to visit. 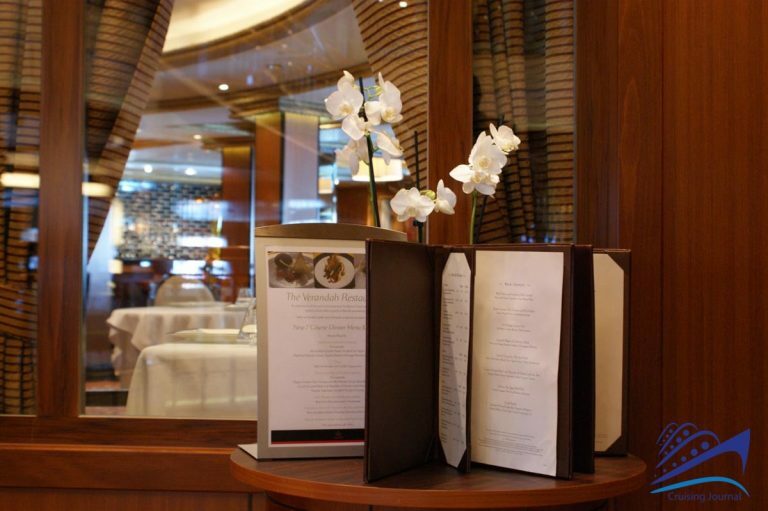 Elegant and refined, it is well worth the extra cost per meal. 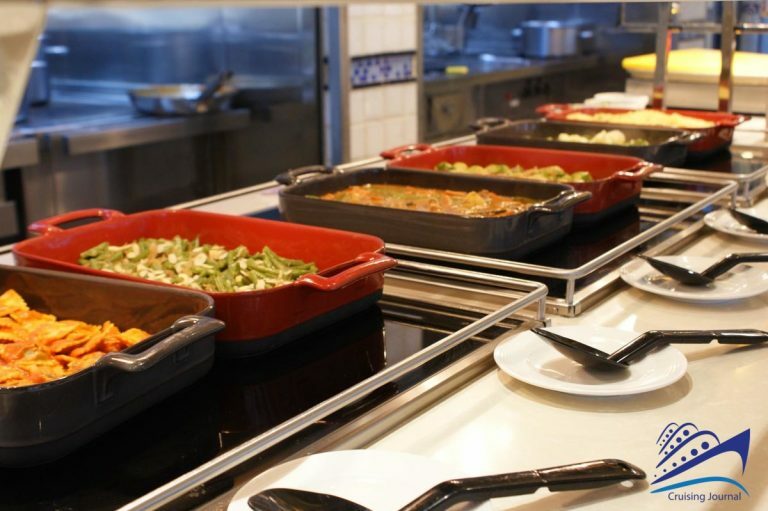 One section of the buffet area is also set up each evening with a theme menu, from Indian, Asian, to Mexican, and it is a reasonably priced alternative dining choice. The cabins on board the Queen Victoria fall into four different categories: Britannia, Britannia Club, Princess Grill, and Queen’s Grill. 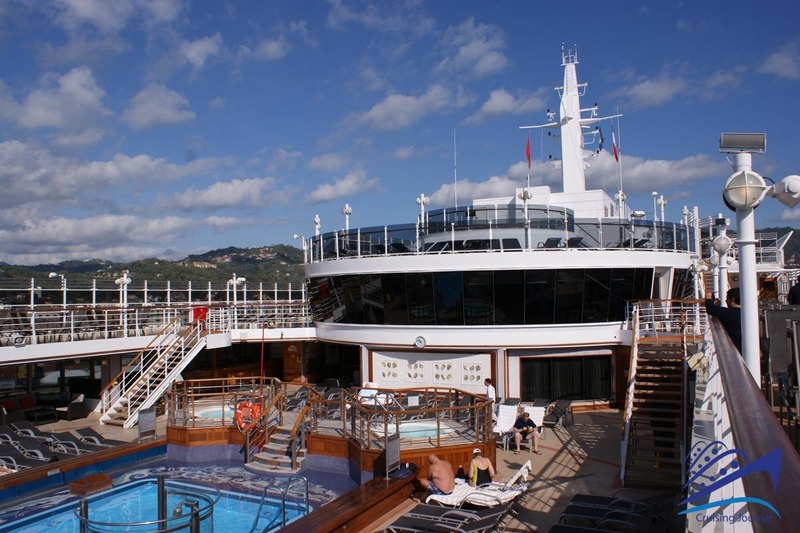 The first category offers interior, exterior or balcony cabins. 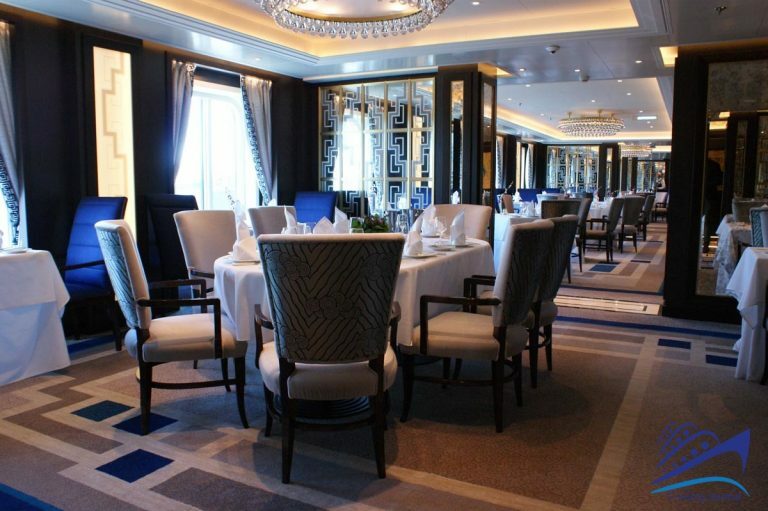 The Britannia Club has its own exclusive restaurant recently added during the renovations carried out at the beginning of the summer. 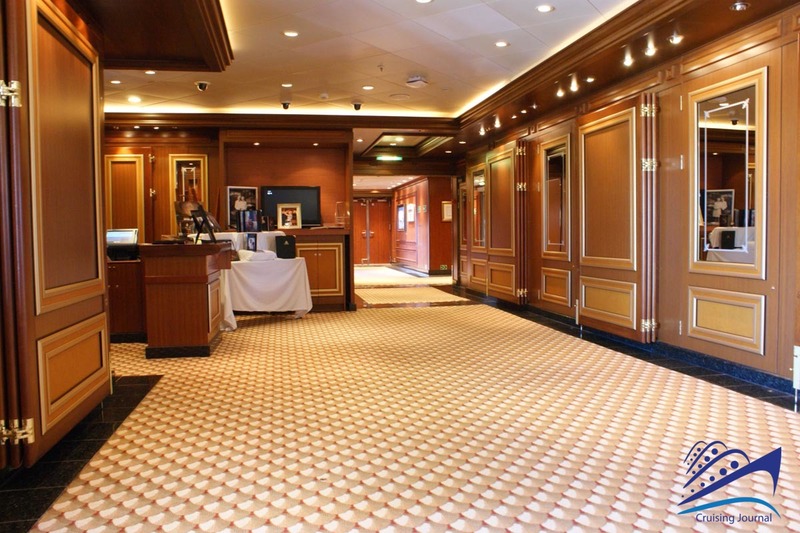 Besides this innovation, this category of cabins does not differ considerably from before. 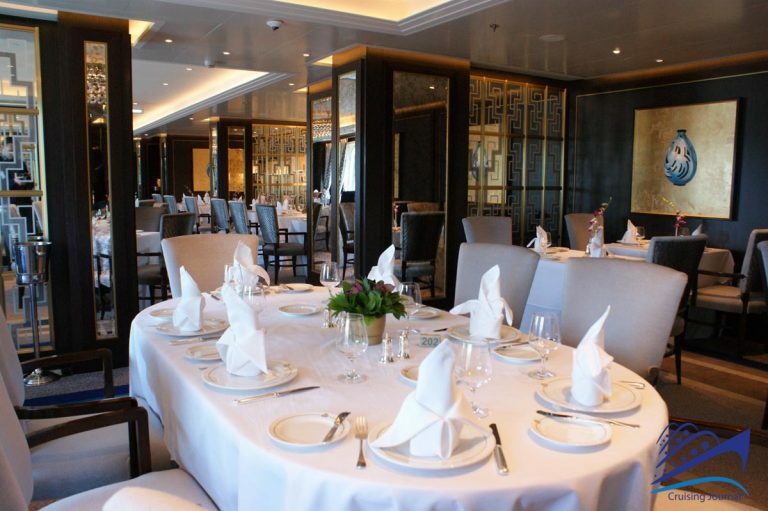 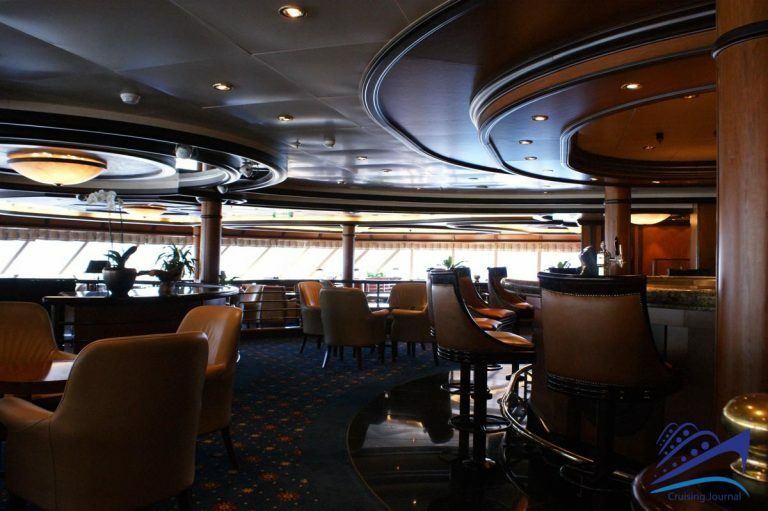 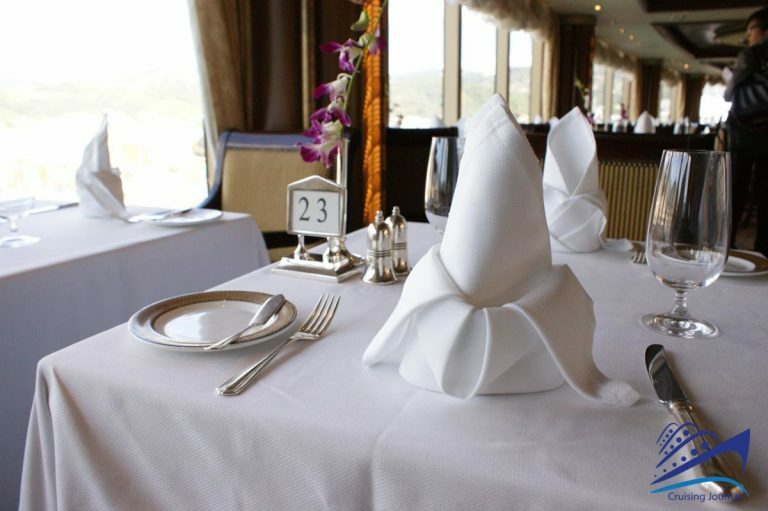 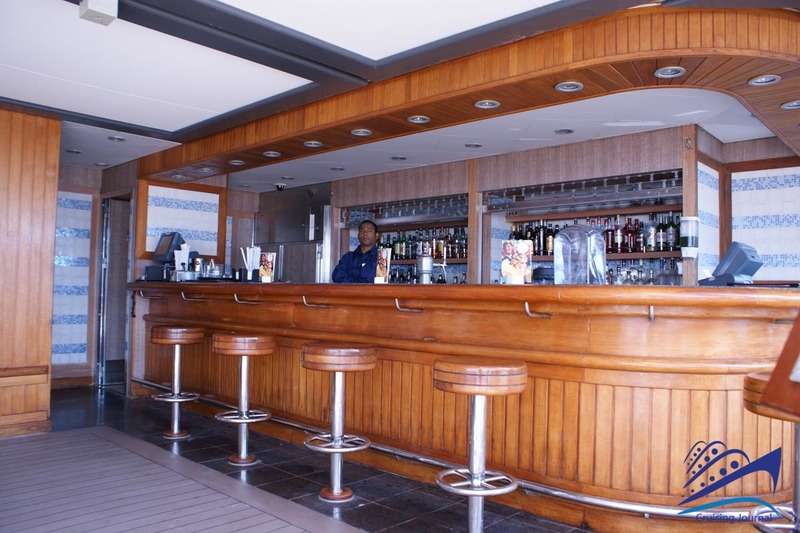 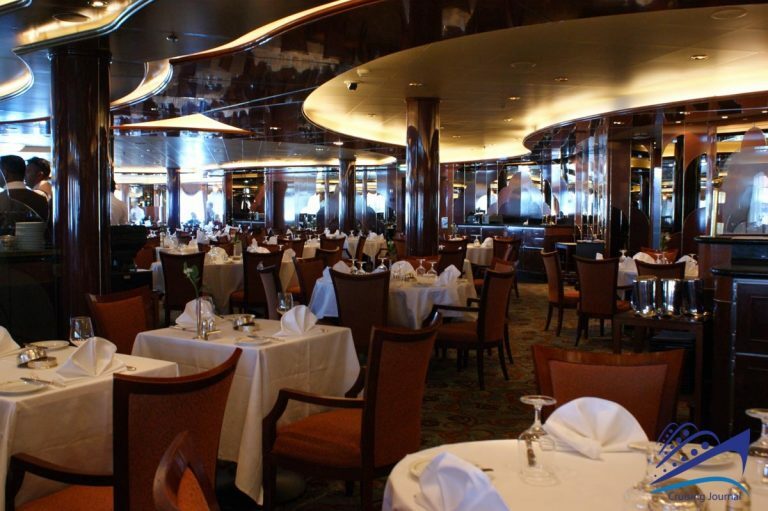 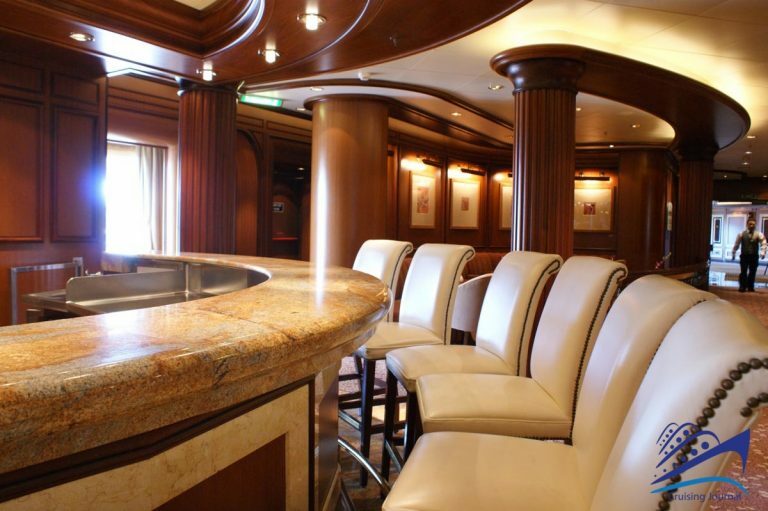 The Grills are all superior suites located in different areas of the ship, and having access to a butler service, greater advantages and amenities in the cabin, as well as an exclusive dining facility.